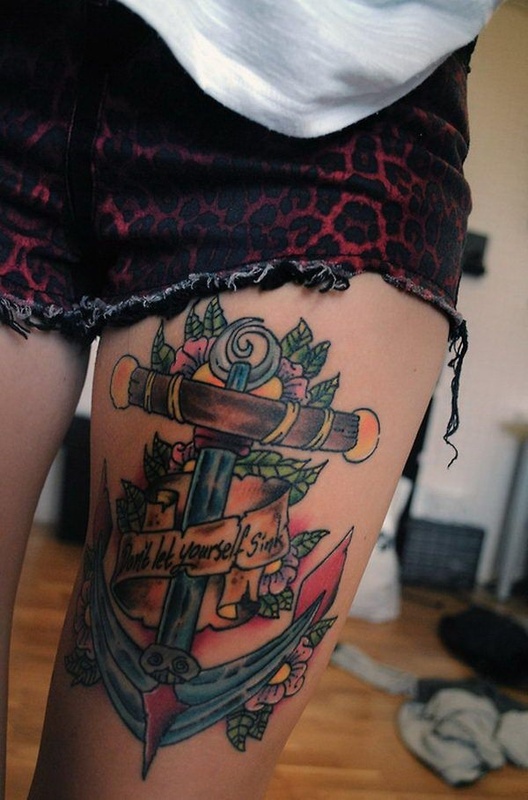 Anchors have been a prolific image in tattooing since the popularization of tattoos in the western world. 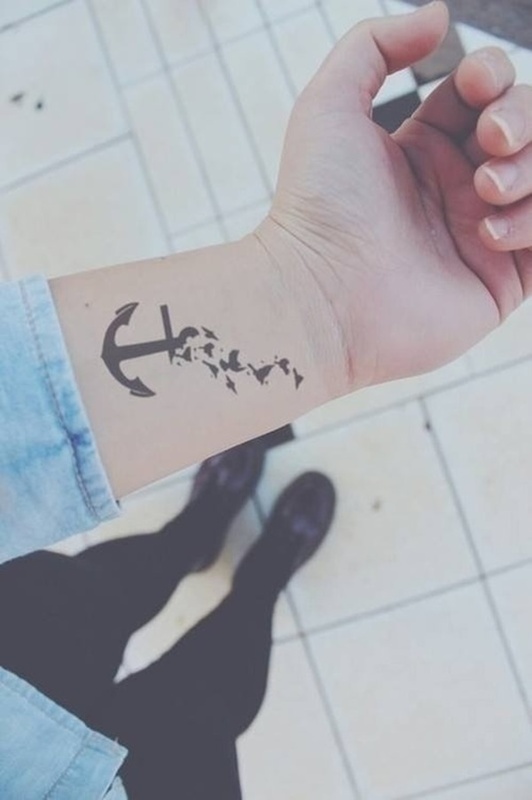 Sailors tattooed themselves to signify accomplishments and status on the ship. For instance, an anchor represented the wearer had either sailed across the Atlantic Ocean or achieved the rank of Boatswain or Chief. 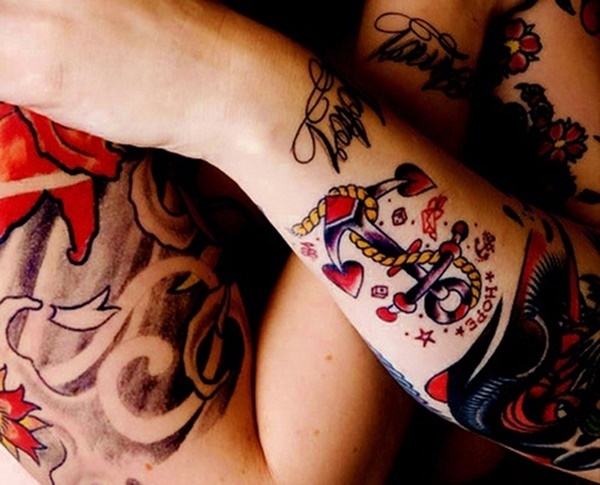 While tattoos are no longer occupationally exclusive, the images popularized by the sailors of yesteryear are still prevalent in modern tattoo culture. 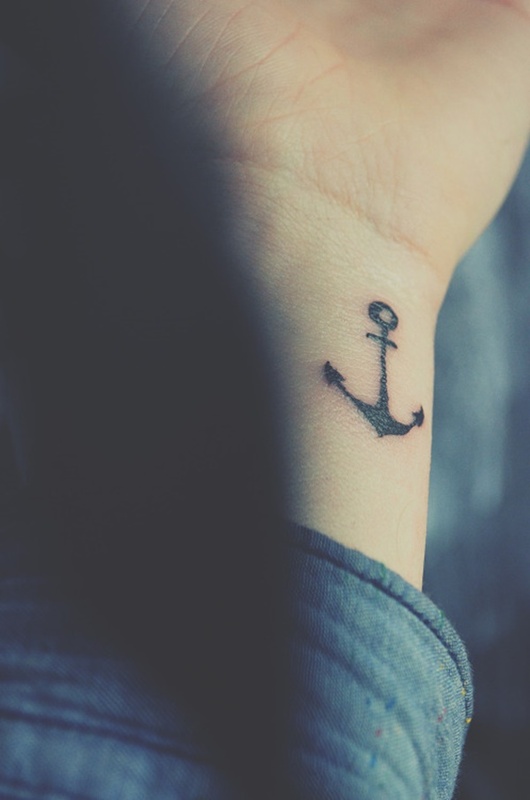 This list compiles 100 tattoos featuring anchors so you can decipher between a tattoo that holds you down, and a tattoo that holds you back. 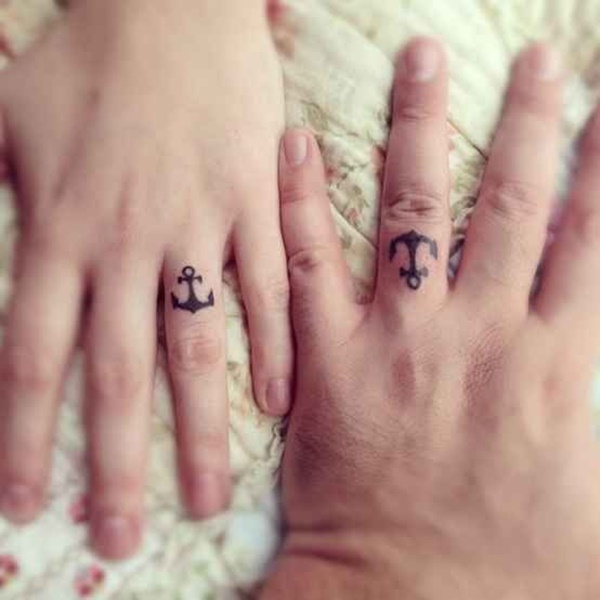 Tattoos on the left ring finger have become a popular alternative to wedding bands. 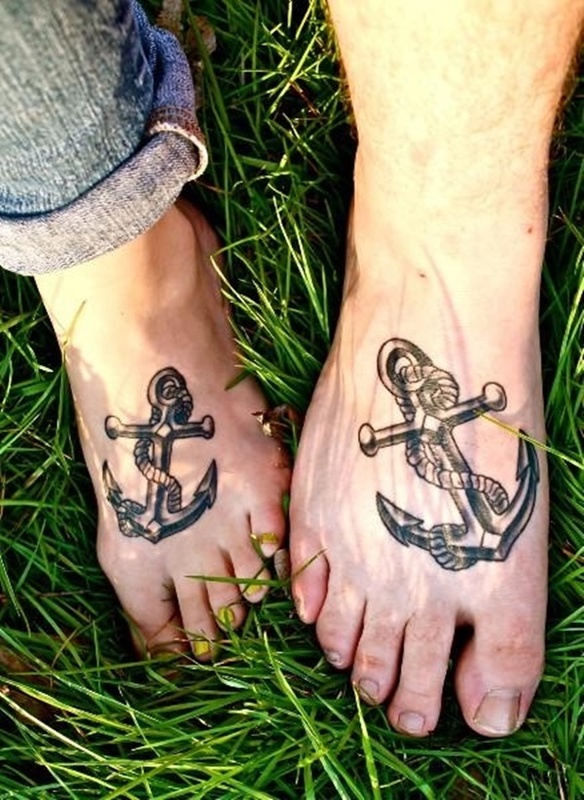 This couple sports a pair of matching anchors to signify their matrimony. 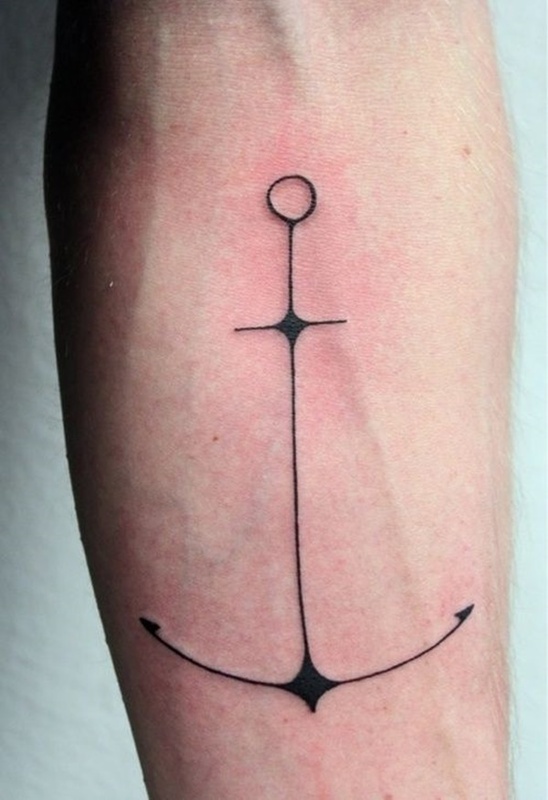 A traditional depiction of a black and grey anchor with an attached rope. Take note of the shaky line work and how the outline of the piece is blurred and undefined. Wood grain is an exceptionally difficult design to replicate in a tattoo and should be reserved for experienced tattoo artists. 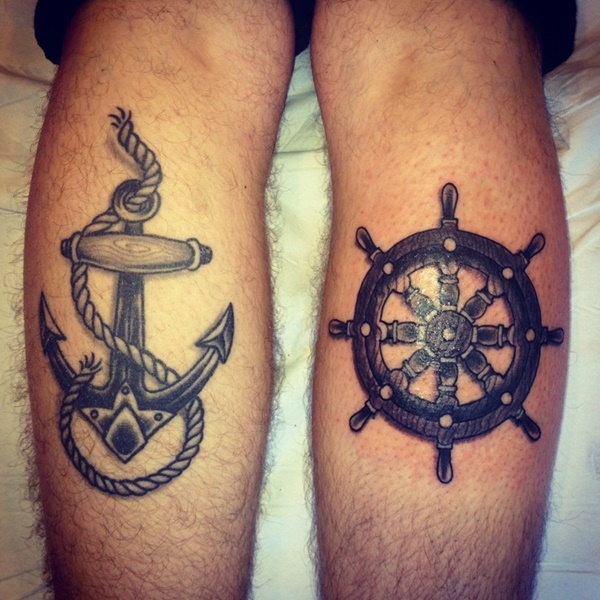 A traditionally styled pair of black and gray tattoos depicting a ships wheel and an anchor. This piece is a much better example of wood grain with the artist using light grey lines to create the effect. 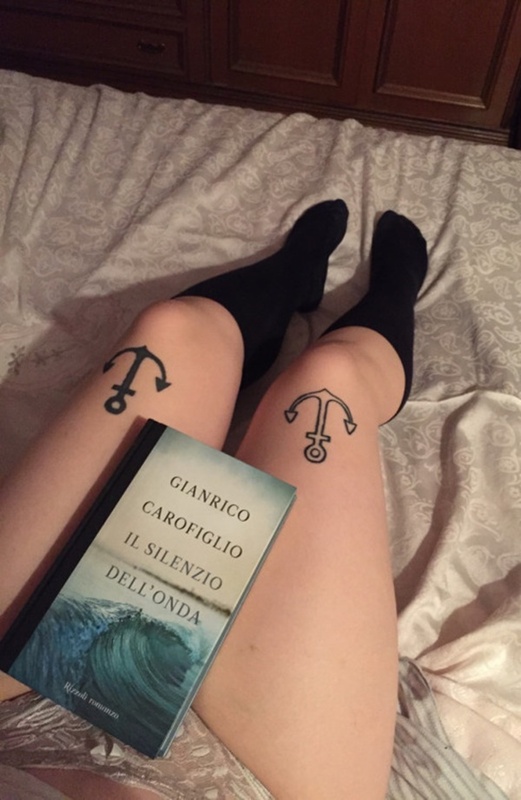 The presence of symbols is overwhelming in this black tattoo. While the lines are sharp and the color is bold the images are cluttered and detract from one another. A scene depicting a shipyard complete with flying birds and a soaring hot air balloon is accented by a compass, longitudinal and latitudinal coordinates, an anchor, and a quote. According to www.latlong.net the coordinates are for a landlocked town in Germany called Altenmunster, I suppose the wearer is only a sailor at heart. The negative space creates this image of an anchor in the center of an ink blot. 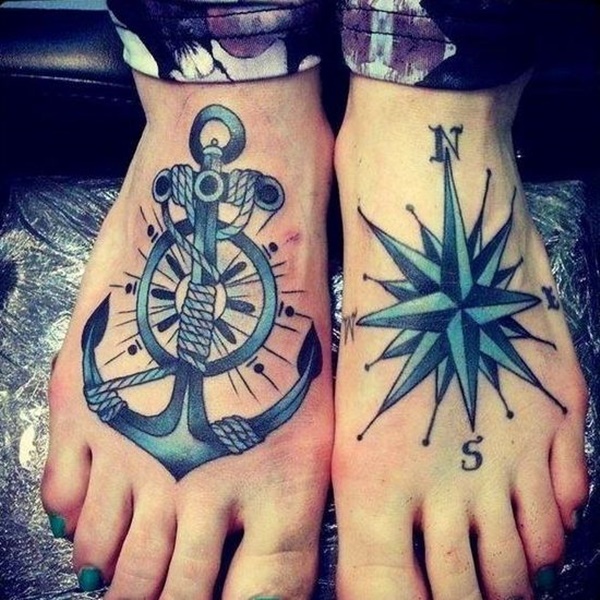 Small, black depictions of an anchor and a ships wheel adorn the wearer’s heels. 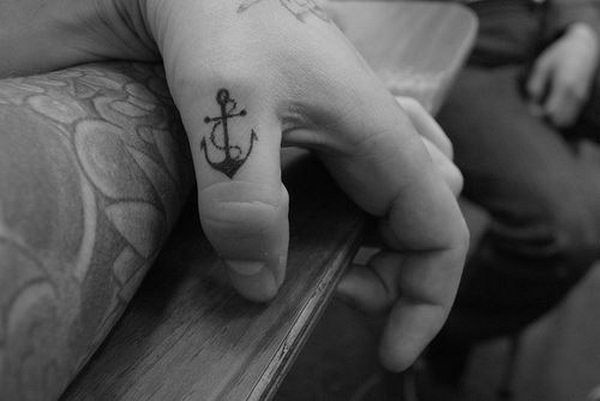 A simple black and gray depiction of an anchor decorates the wearer’s thumb. 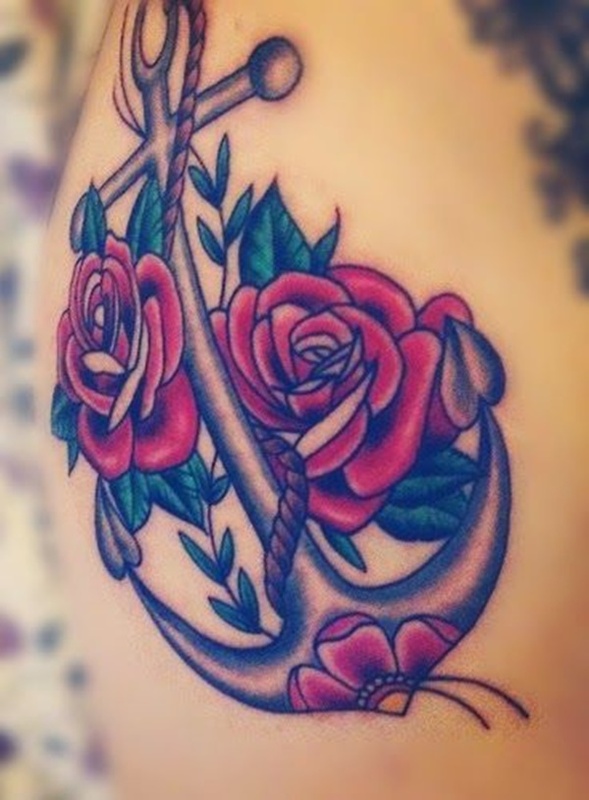 Roses add a feminine touch to a traditionally styled anchor in this tattoo. 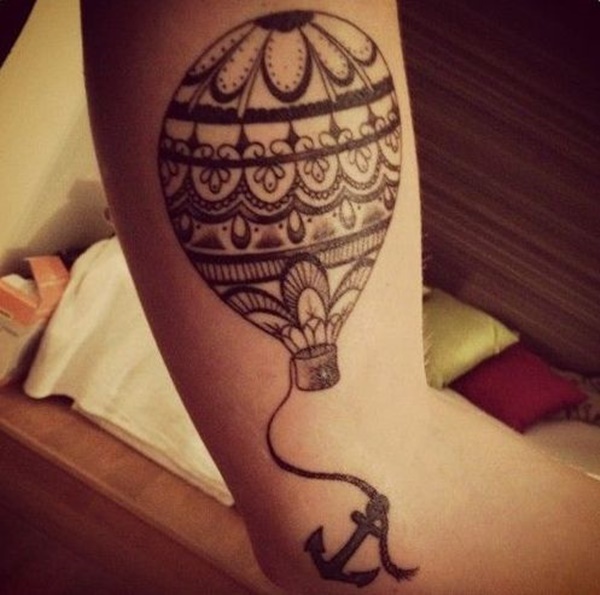 A hot air balloons basket is replaced with an anchor in this imaginative black and gray tattoo. 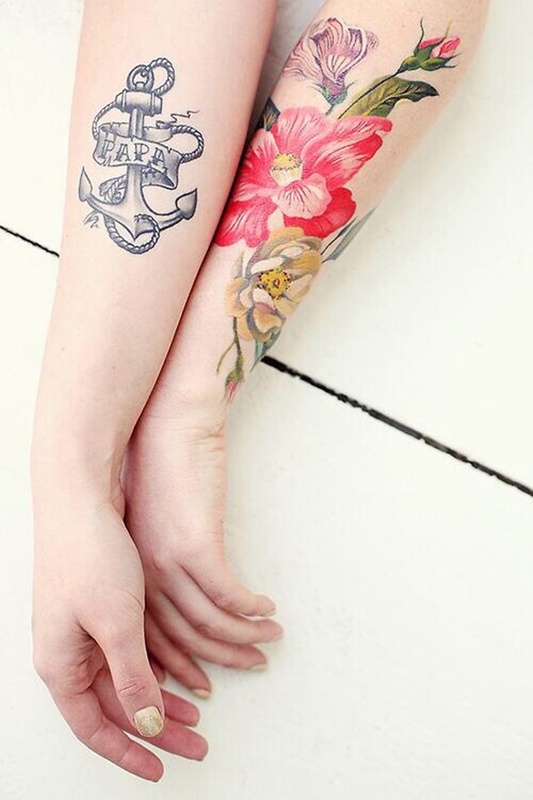 This colorful tattoo portrays a vibrant blue anchor, a hummingbird, and a dove in a watercolor style. 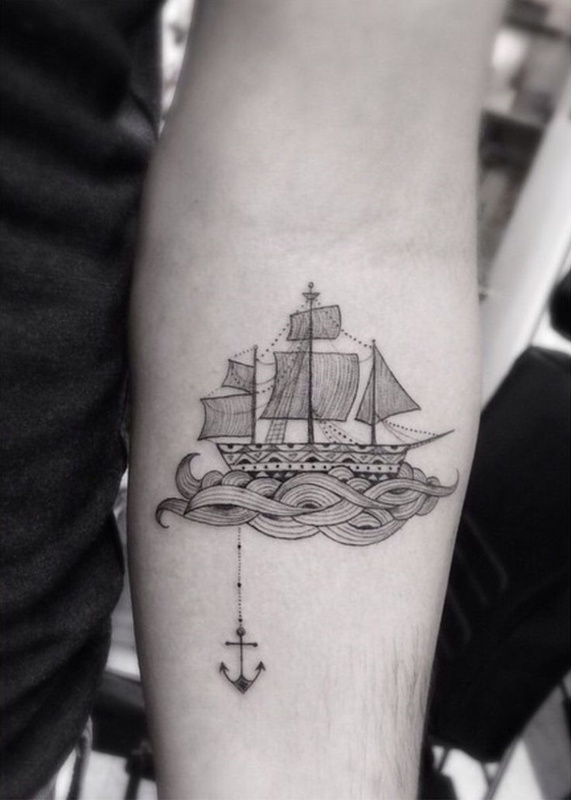 A very stylized ship drops anchor through a series of interwoven waves. This pieces delicate line work and detail are reminiscent of the nautical pass time scrimshawing. This exceptional tattoos uniqueness is created with details. 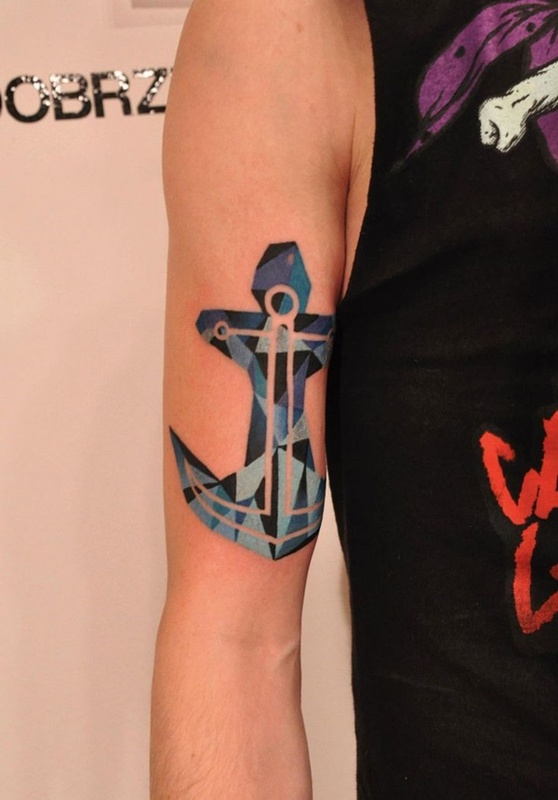 The anchor is comprised of geometric shapes, some of which are shaded with diagonal lines, while the anchor itself sits atop a larger geometric design embellished with watercolor splashes of blue. A blue palette is used to create the images on this wearer’s feet. 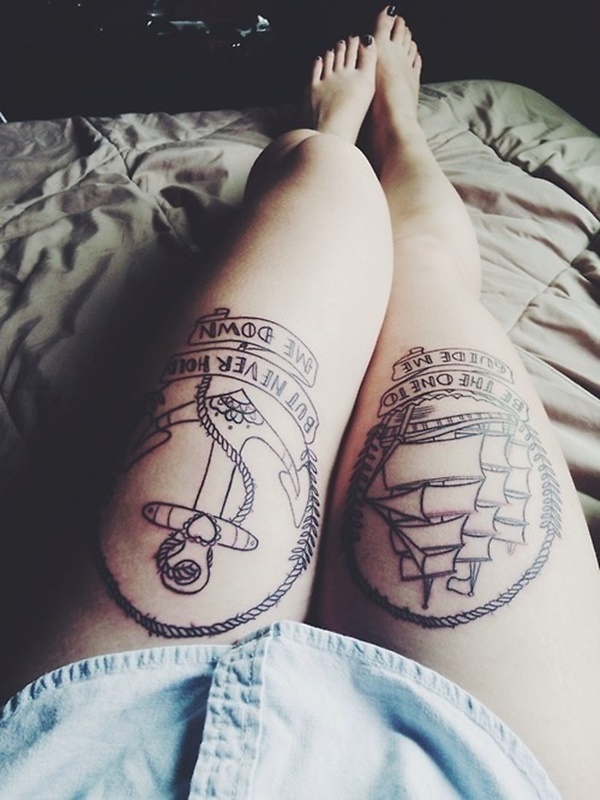 On one foot a rope wrapped anchor sits atop a ships wheel while the other foot shows three layered nautical stars and letters representing North, South, East, and West. 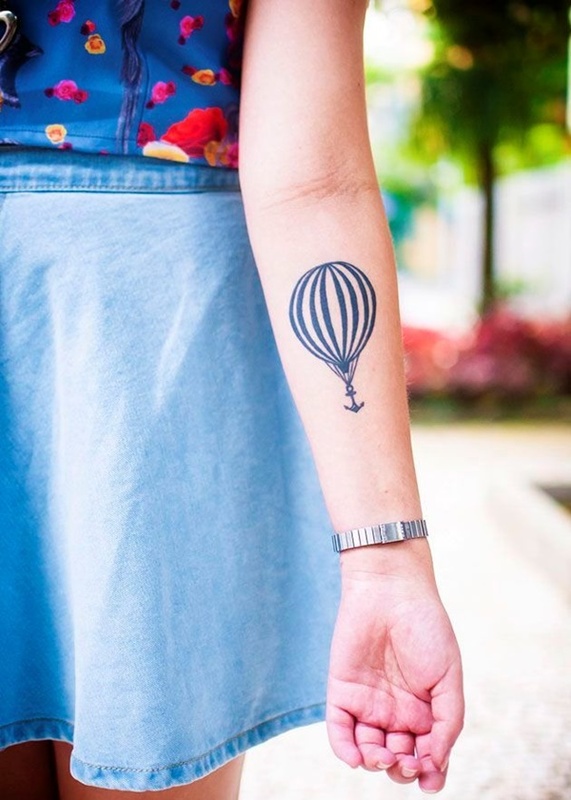 A variation of the tattoo we saw earlier, this tattoo shows a hot air balloon attached to an anchor. The elaborate design on the balloon creates an air of femininity. 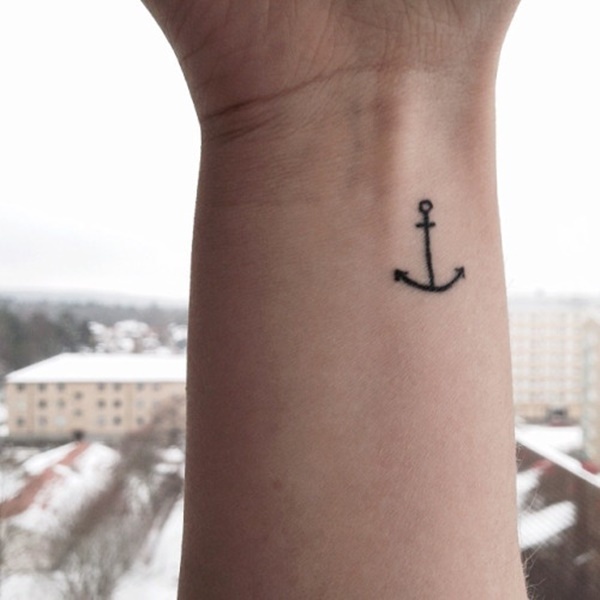 A minimalist depiction of a black anchor is displayed on the wearer’s upper arm. 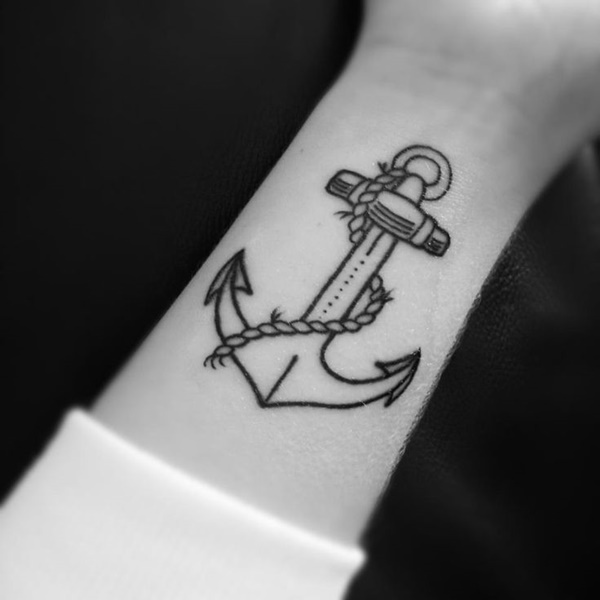 An anchor is encircle by a rope that separates the image from the surrounding nautical star and steering wheel. 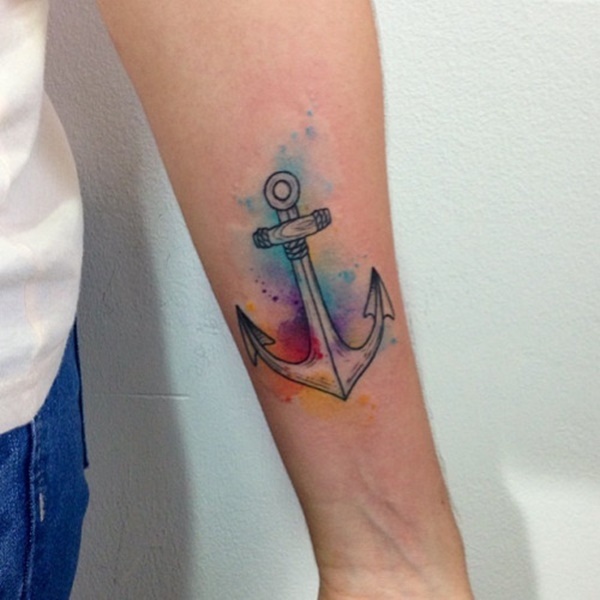 A brightly colored anchor sports a heart at the top intersection and adorns the wearer’s forearm. 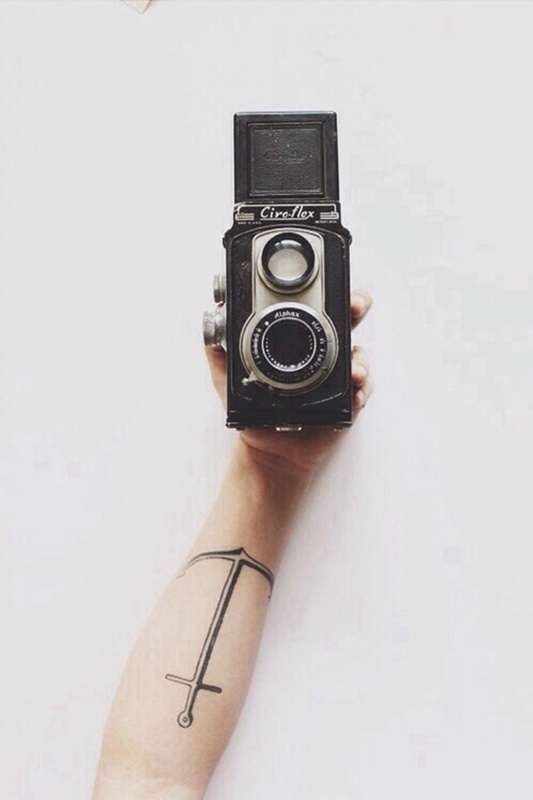 The smaller the tattoo, the more difficult the tattoo. 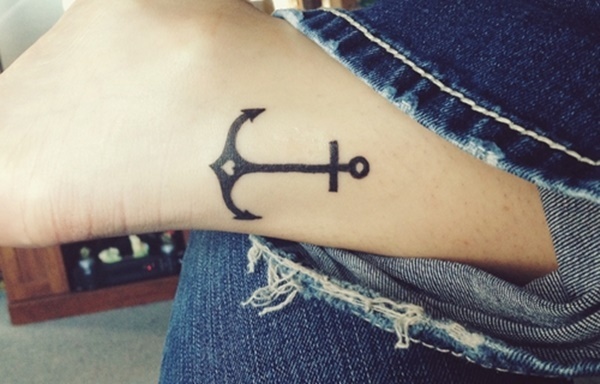 As seen here, small mistakes are amplified on a smaller tattoo, the flukes of the anchor are noticeably asymmetrical. 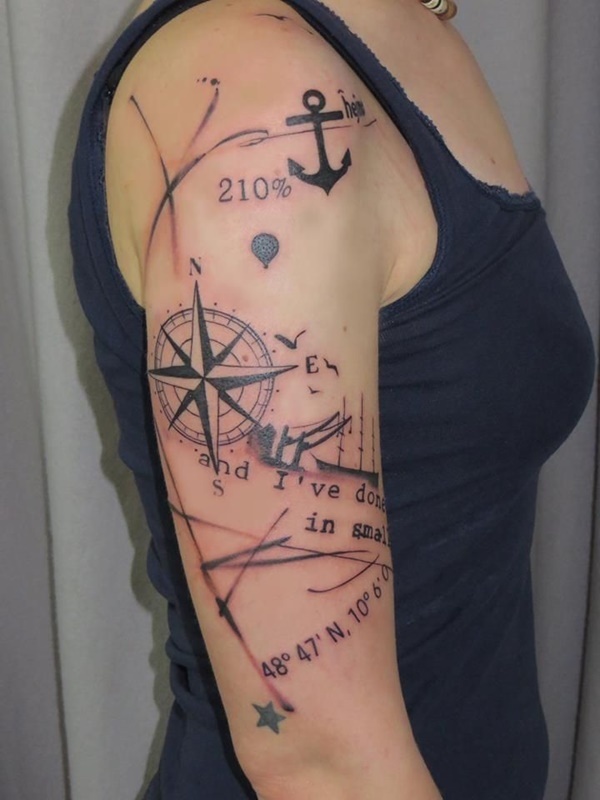 Three staples of nautical imagery are depicted in this sketch style tattoo. 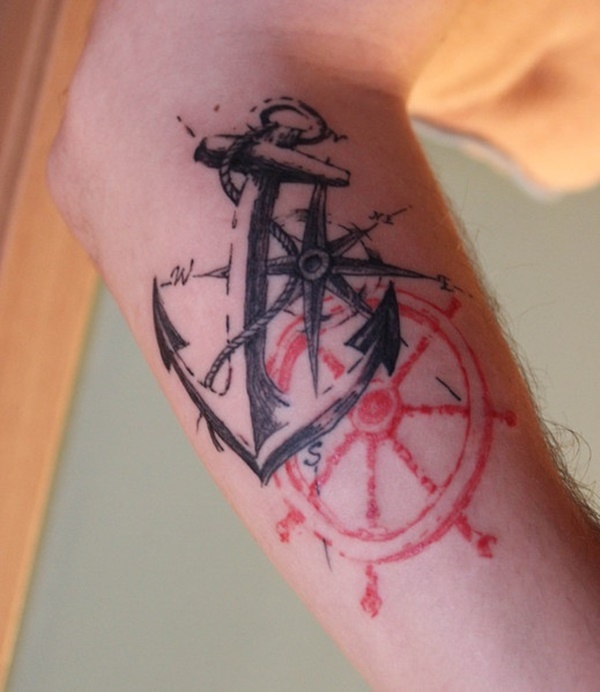 The black and gray anchor and compass contrast with the bright red ship wheel. 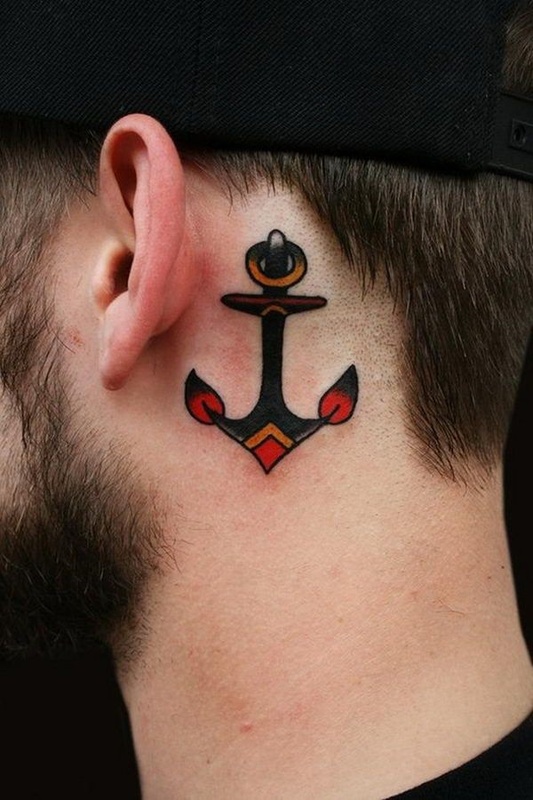 A traditionally styled and colored anchor is placed behind the wearer’s ear. An all black anchor is composed of very thin lines. 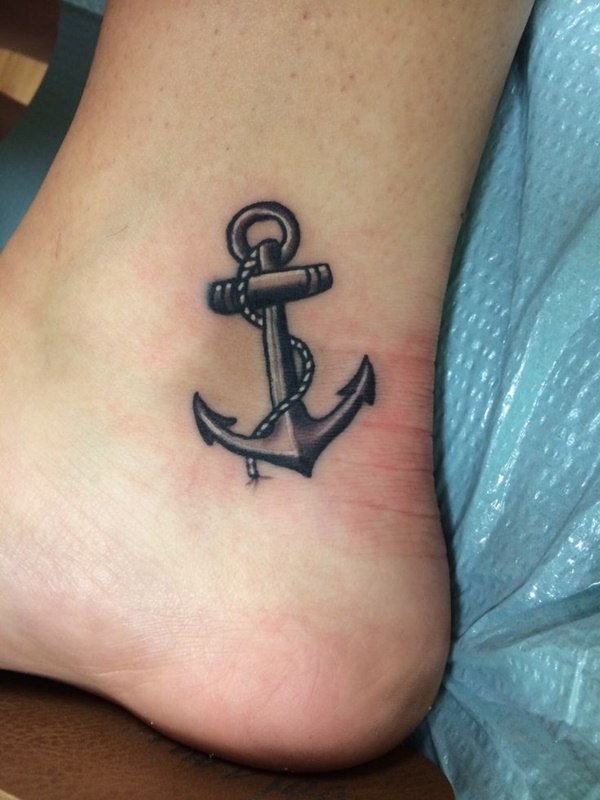 A simple black anchor is tattooed near the wearer’s heel. 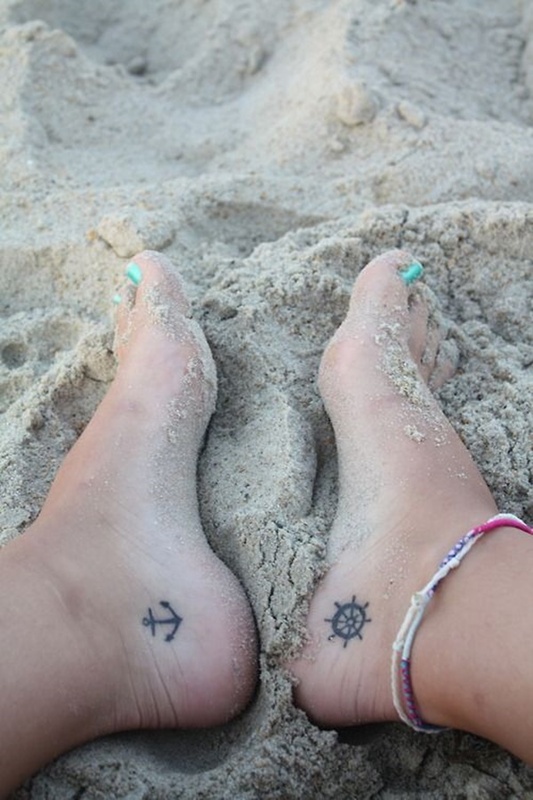 A couple proudly shows their matching feet tattoos. The image portrays a very well-shaded anchor wrapped with a rope. 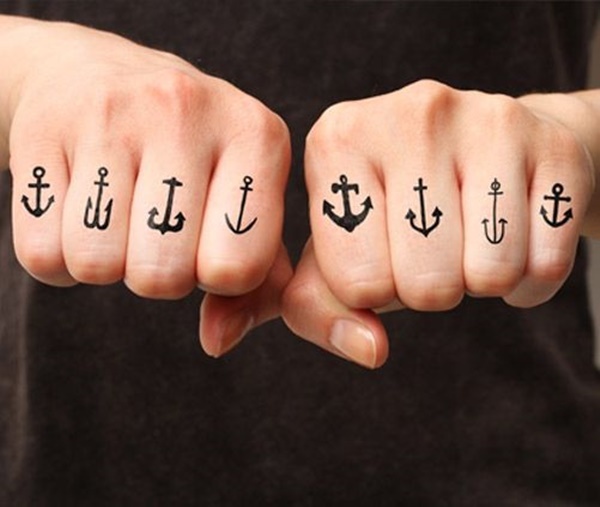 Varying styles of anchors are shown across the wearer’s knuckles. 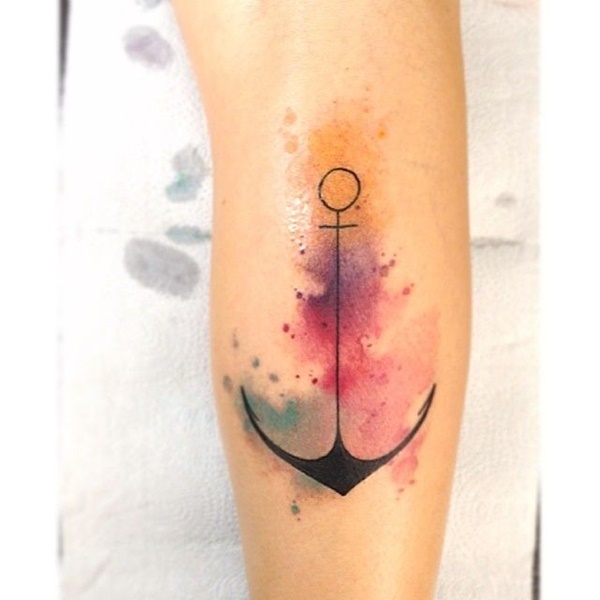 An anchor composed of exceptionally thin lines is inked over a smear of orange, purple, red, and blue watercolors. 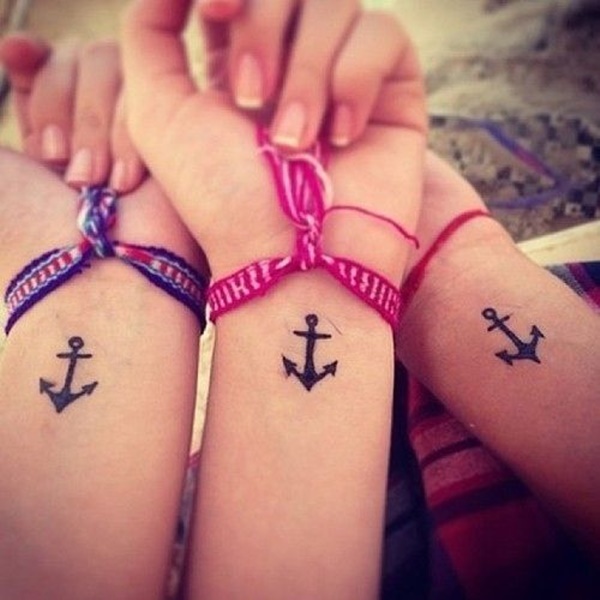 Three wearers display their matching wrist tattoos portraying a bold, black anchor. A well shaded black and gray anchor is pictured with a feather through the loop and wrapping around the body of the anchor. 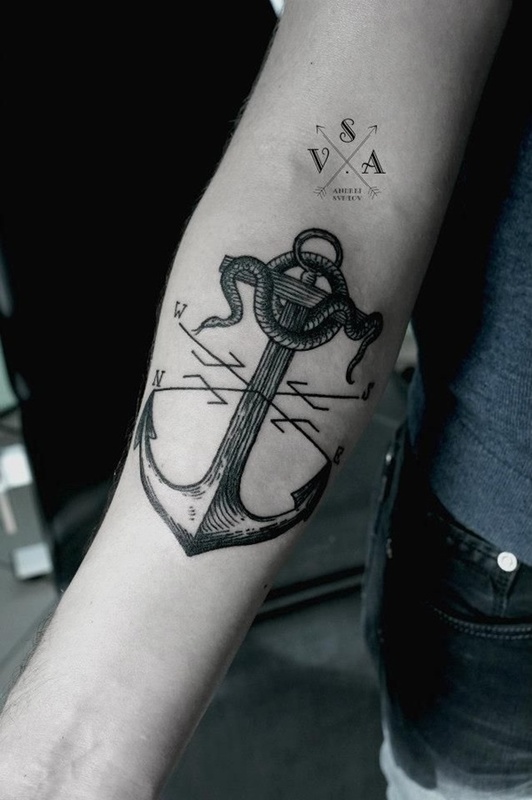 Black outlines compose the image of an anchor and a rope. The absence of shading makes the piece bold as it contrasts against the un-inked skin. 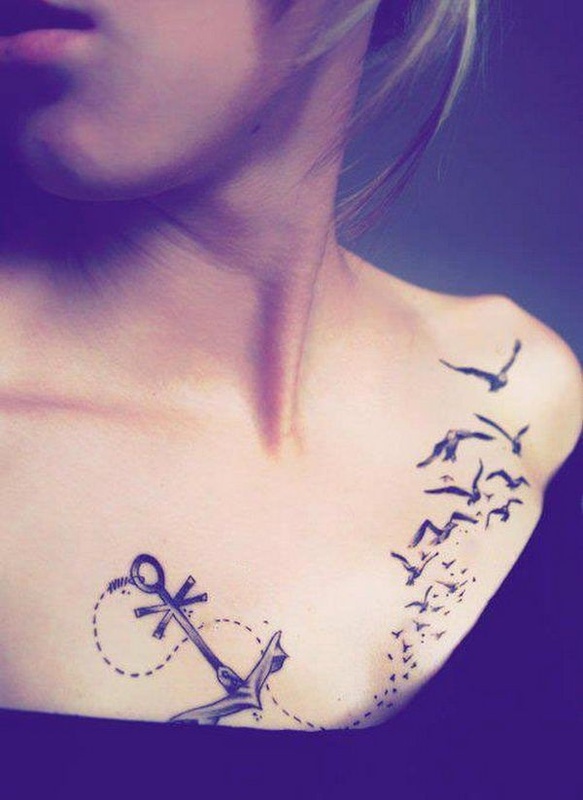 A stylized black and gray anchor is attached to a dotted line that turns into a flock of flying birds. A unique, eye catching tattoo using popular elements. 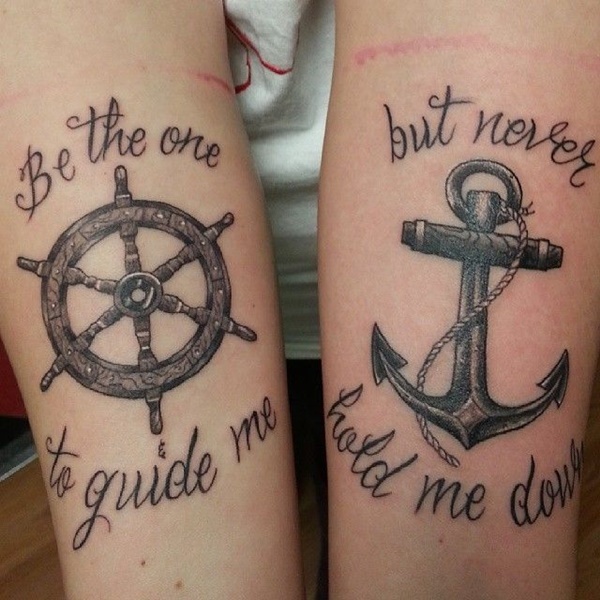 This set of tattoos uses black, gray, and white to compose images depicting a ship wheel and anchor surrounded by quotes. 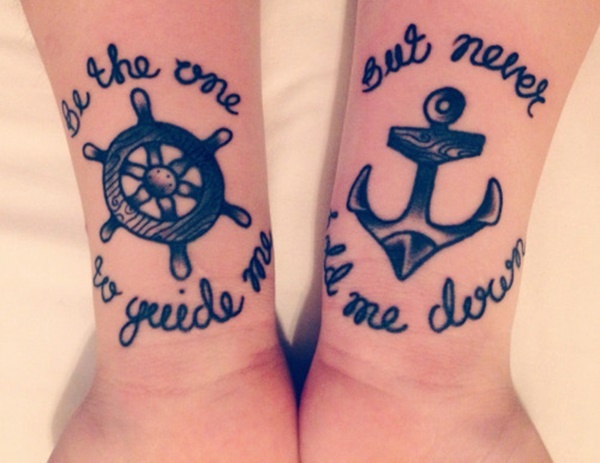 The quote “Be the one to guide me” surrounds the wheel, while “But never hold me down” surrounds the anchor. The quotes are a clever nod to the functions of the depicted items. 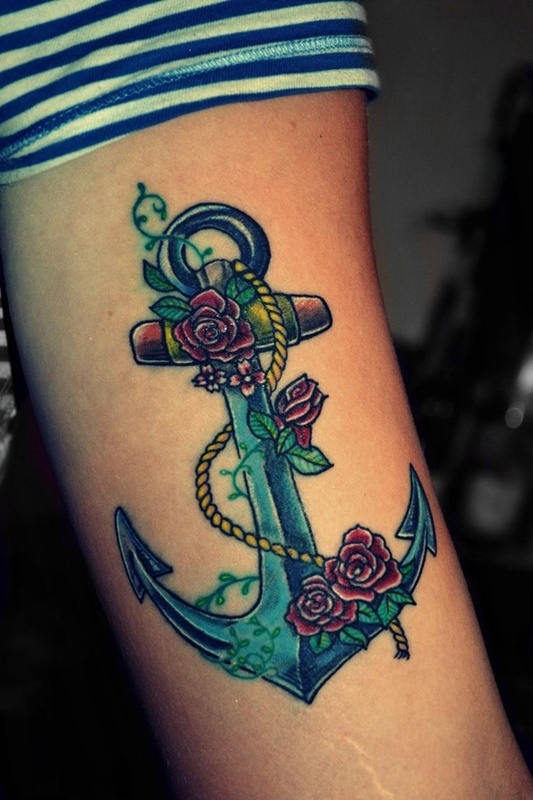 A pretty, bright blue anchor is embellished with colorful roses, a rope, and vines. An anchor is shown at the center of a compass with a snake laying across the stock. 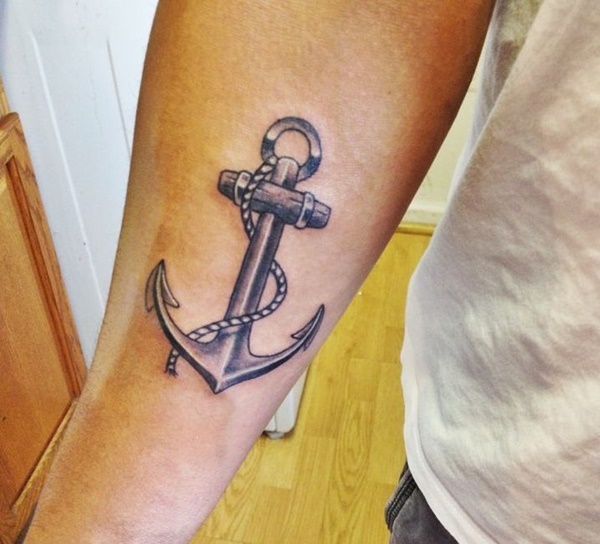 The deliberate use of lines to shade the anchor create depth in the piece and make the design pop. An anchor created using thin lines sits over an E pictured with a script font. 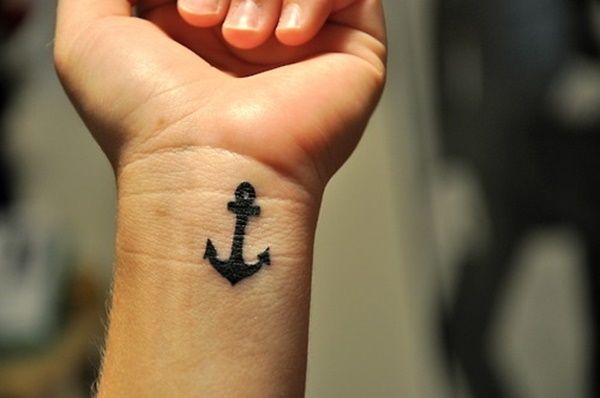 A small, black anchor is pictured on the wearer’s wrist. 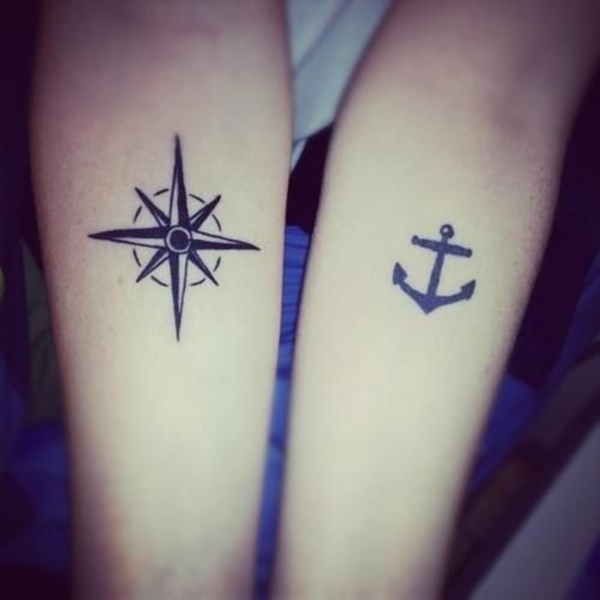 A set of black tattoos depict a compass on the wearer’s right forearm and an anchor on the wearer’s left forearm. 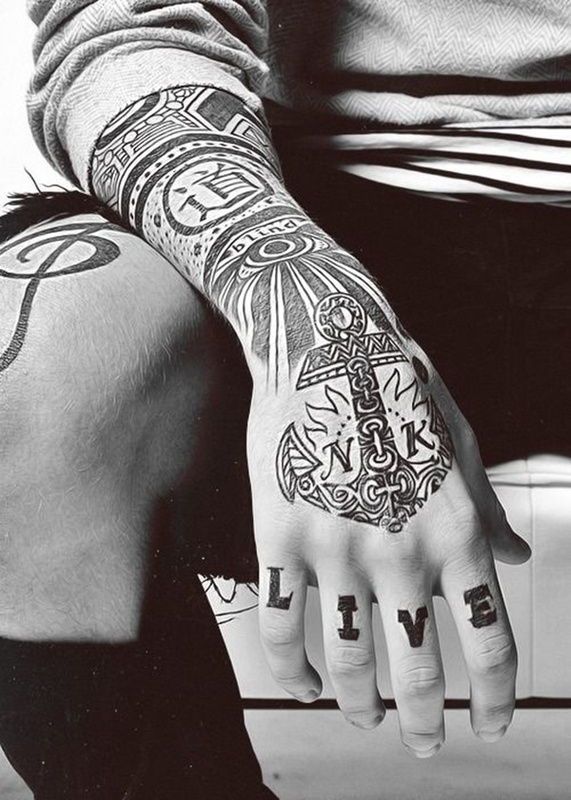 A variation of the tattoo we saw earlier shows the same quotes and images on the wearer’s thighs. 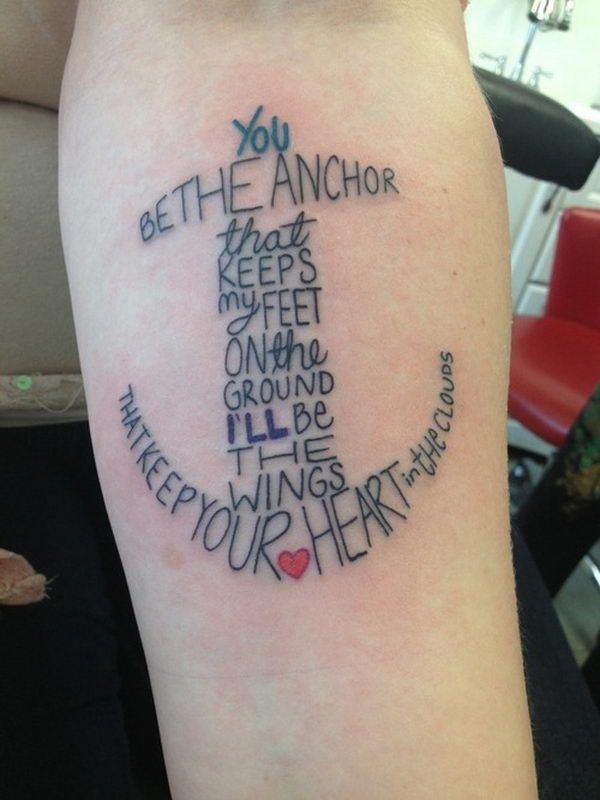 The quote, “You be the anchor that keeps my feet on the ground I’ll be the wings that keep your heart in the clouds” is written in a format that creates the shape of an anchor. Completely black coloring is usually reserved for tribal tattoos and tattoos too small to detail. 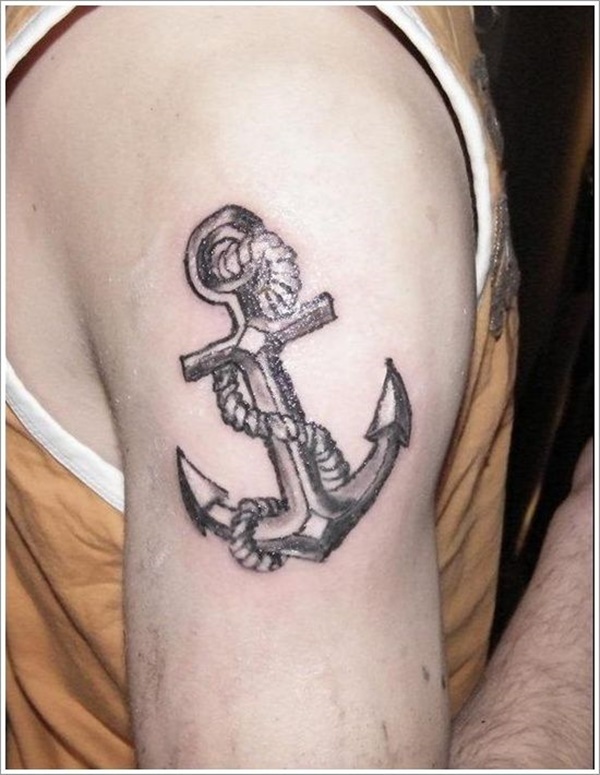 However, completely blacking out a tattoo makes for a bold piece as shown in this depiction of a blacked out anchor. 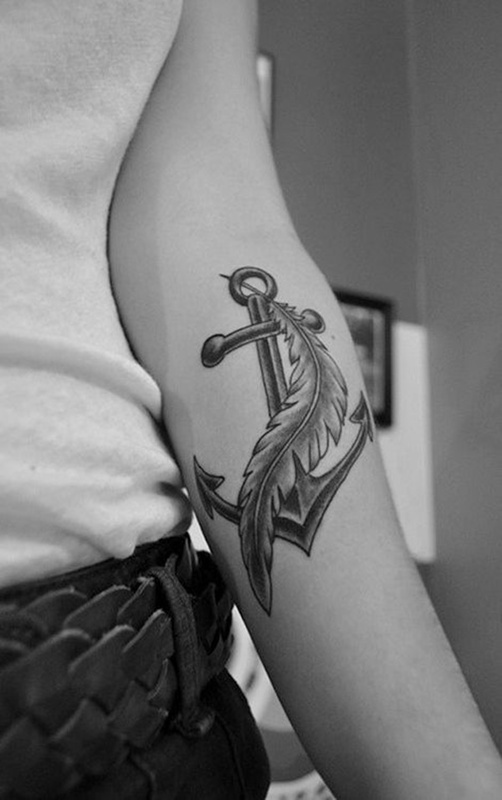 A black and gray portrayal of an anchor is made exceptional with meticulously detailed shading. 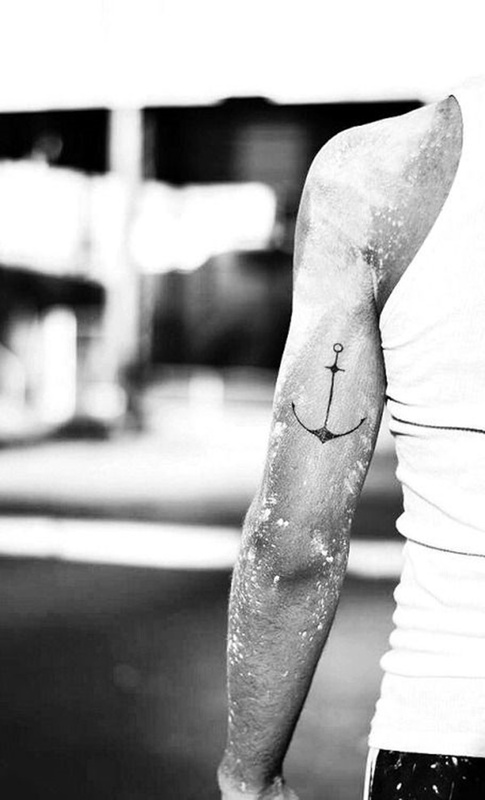 White ink is used to give the impression of reflecting light in this anchor tattoo. 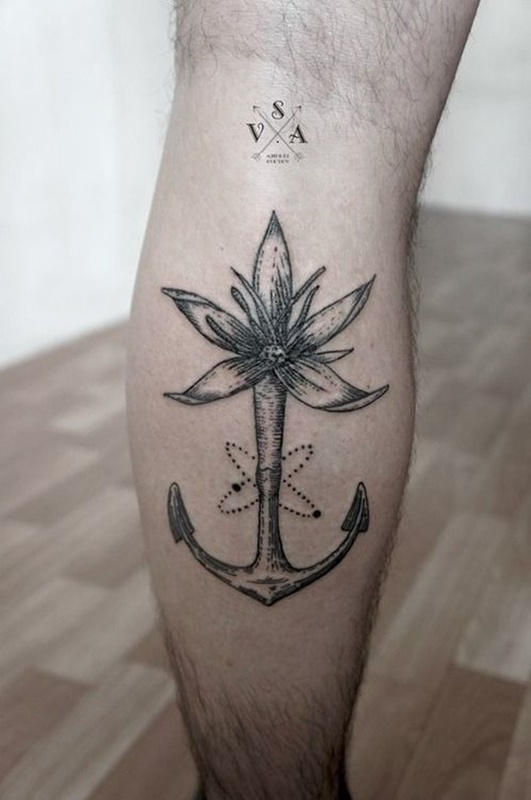 The stem of a flower turns into the shank of a boat anchor while protons and neutrons fly around an unseen nucleus in this highly detailed tattoo. 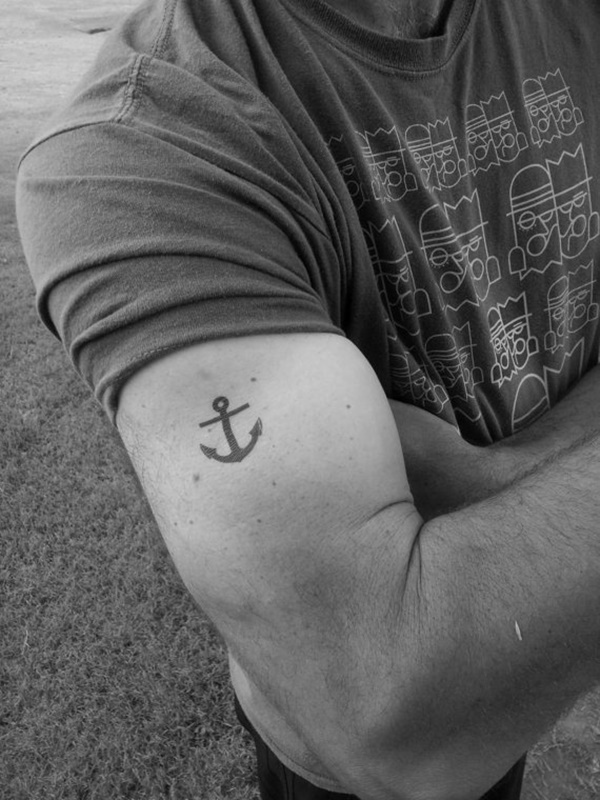 An undersized, black anchor is shown on the wearer’s bicep. 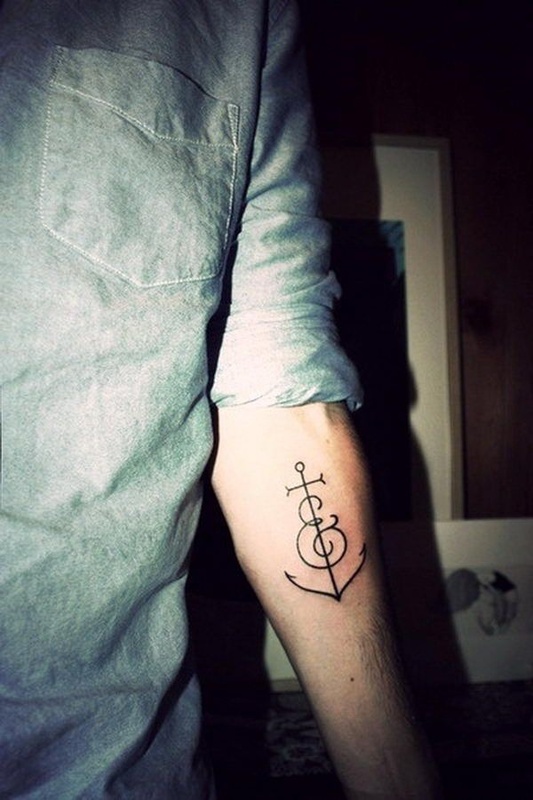 While small tattoos are fashionable, on large sections of skin like the bicep the tattoo can look dainty and out of place. 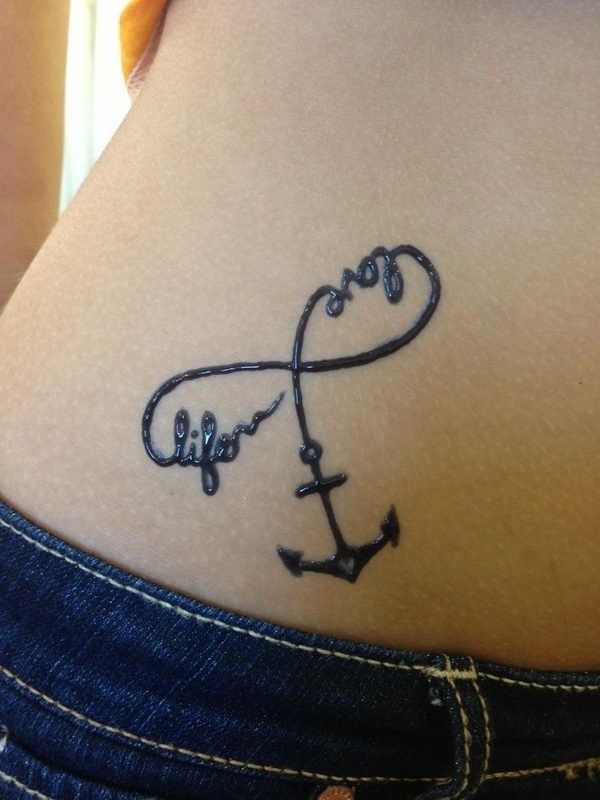 The words “Life” and “Love” are create a section of an infinity symbol that leads into an anchor in this black tattoo. A colorful anchor is wrapped with a rope attached to a lock and looped through a key. The anchor is embellished with an eyeball where the where the shank and stock intersect and a heart at the point of the crown. 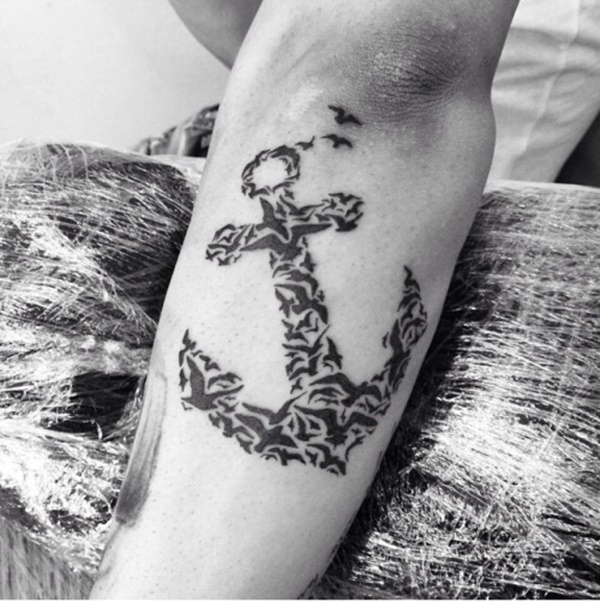 A black and gray anchor is enlivened with the use of shading and adorns the wearer’s forearm. 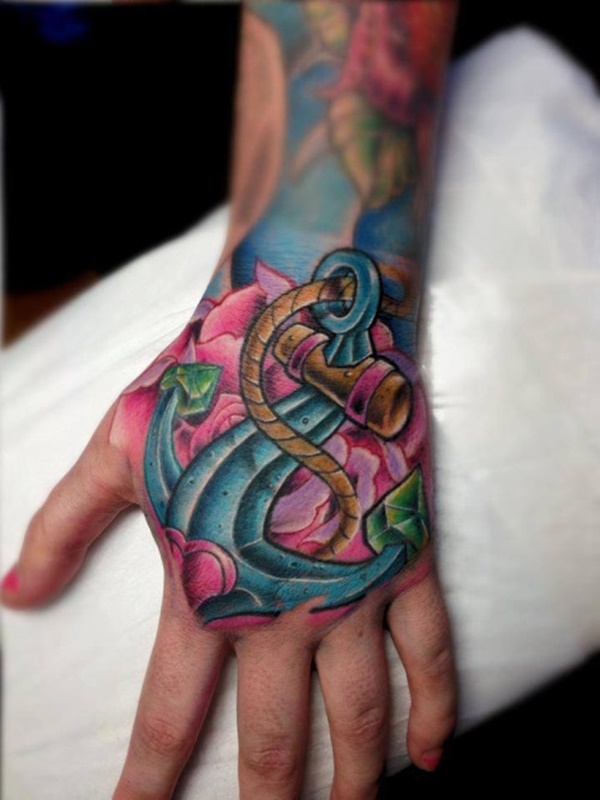 Using a varying color palette, this stylized anchor is wrapped with a banner saying “Don’t Let Yourself Sink” and is surrounded with flowers. 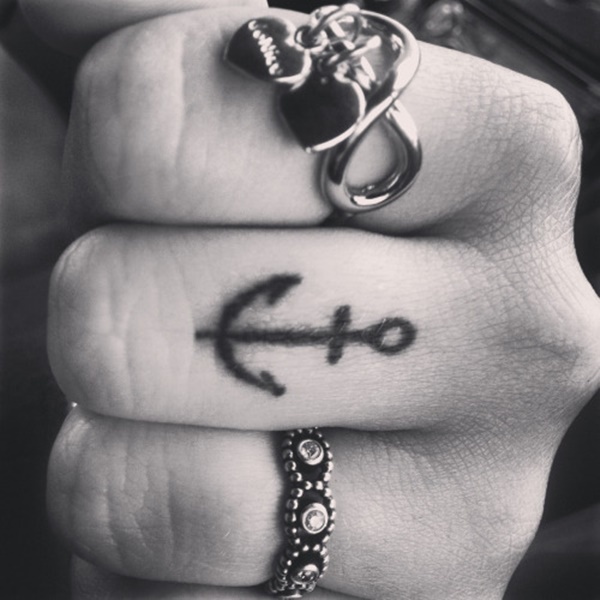 A thin black anchor is embellished with a heart on the shank and is located on the side of the wearer’s middle finger. 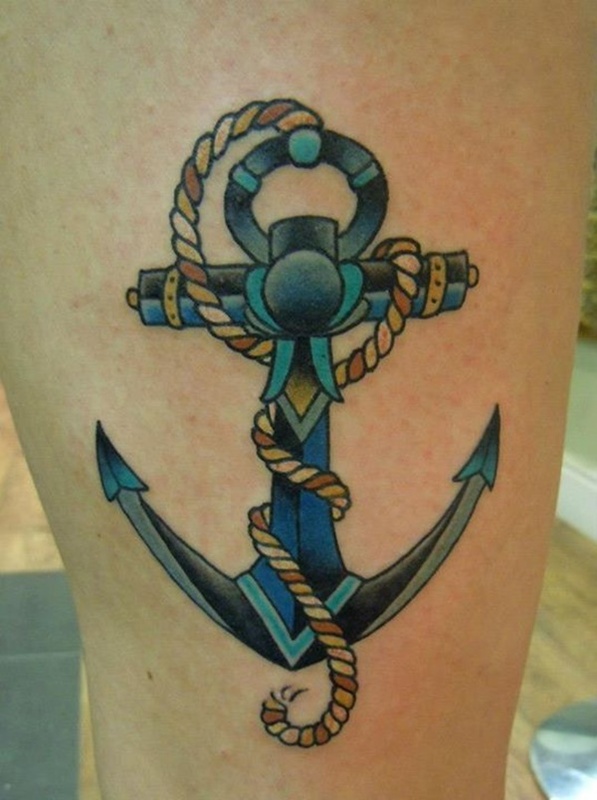 An ornate anchor is pictured using blues and blacks and is wrapped with a rope colored in an alternating pattern. While this tattoo shows an adept use of color, the line work is noticeably sloppy and ruins the aesthetic of the piece. 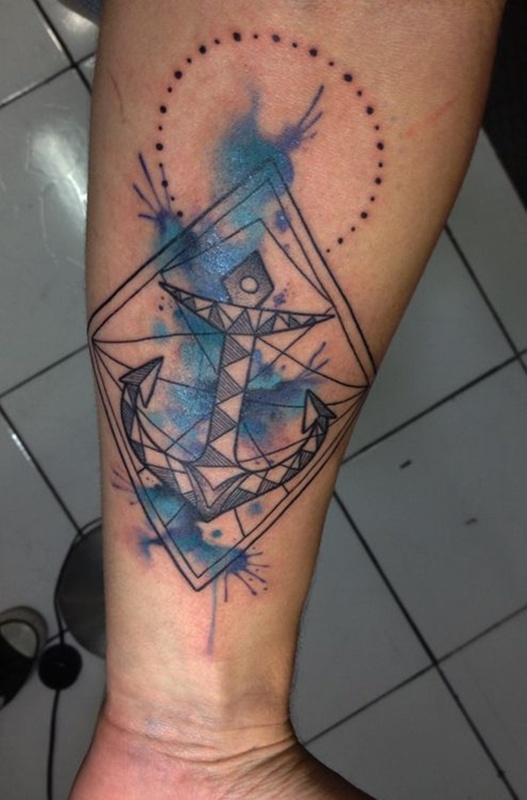 A multi-faceted blue and black outline surrounds an anchor created using negative space. This piece is unique and exhibits a great use of color and shapes. 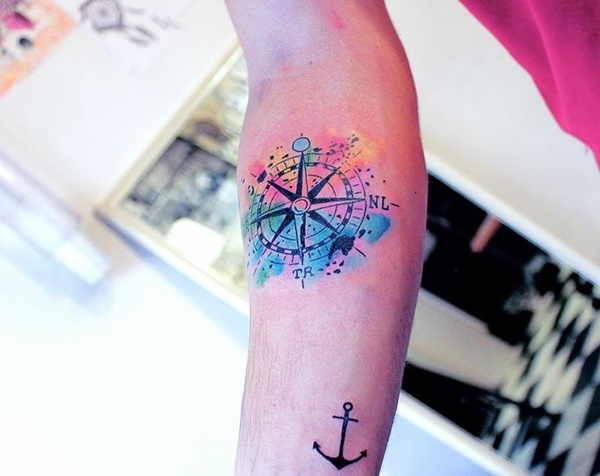 In this tattoo the anchor is an accent to a black compass over a smear of watercolors. 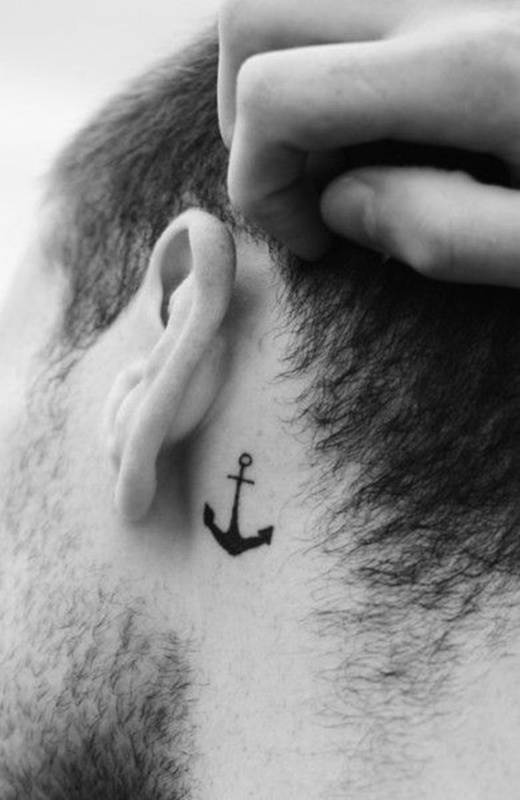 A thin, black anchor is displayed on the back of the wearer’s bicep. Two stylized anchors decorated with bows and flowers dangle from a set of roses with skulls in the center. The lines connecting the flowers to the anchors are embellished with additional hearts and leaves. 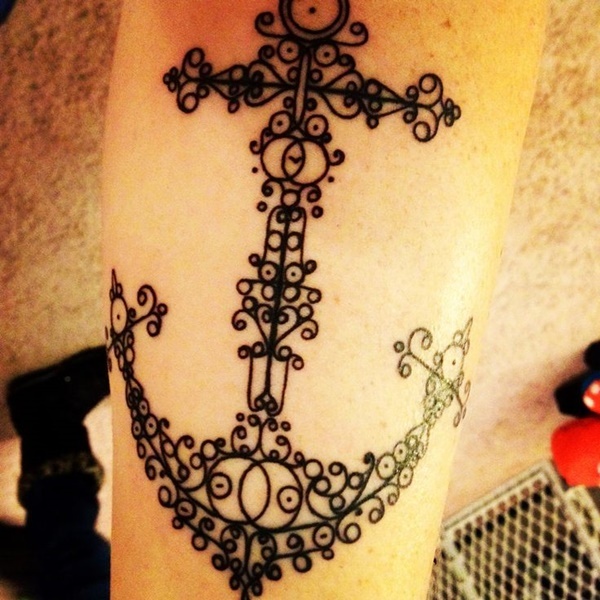 This anchor is comprised of an intricate series of scrolled lines. 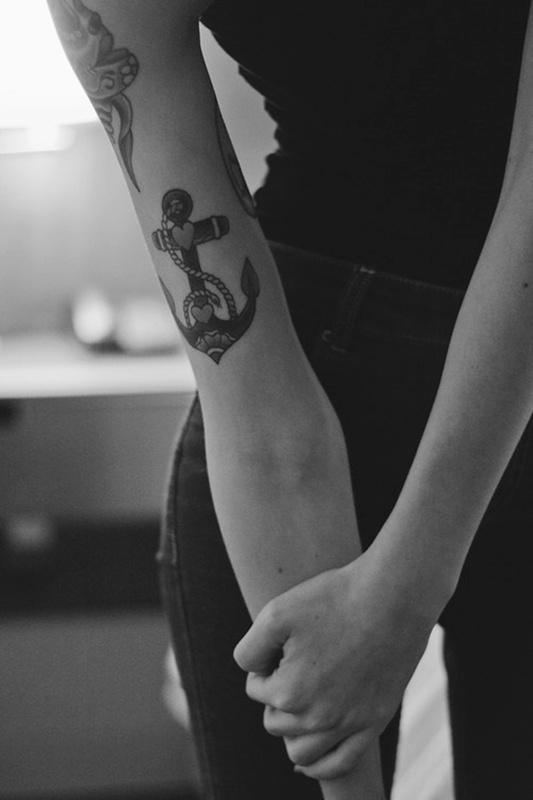 The scrolls add femininity to a traditionally masculine image like an anchor. 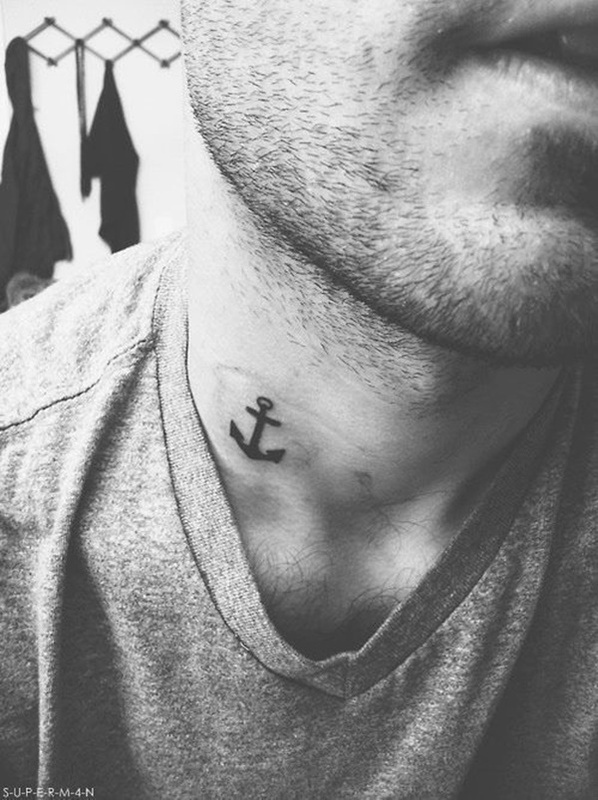 A black anchor is shown near the bottom of the wearer’s neck. 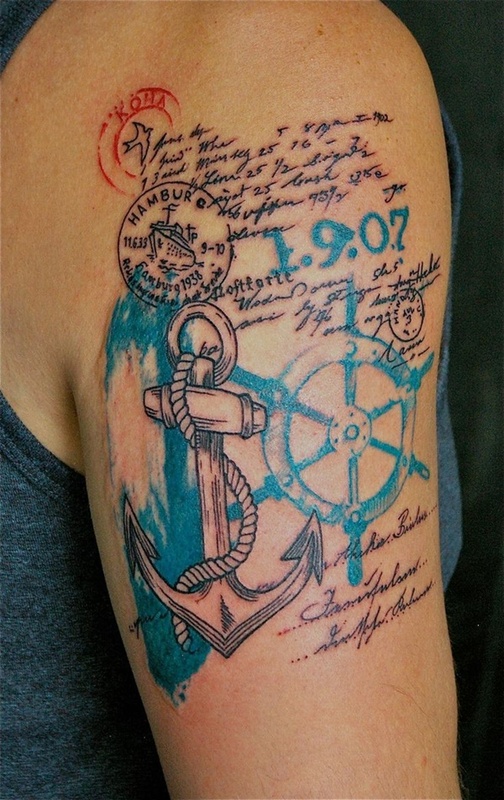 A black anchor is surrounded by cursive writing, a blue ship wheel, a blue date, and stamps from Hamburg, Germany and Kona, Hawaii. 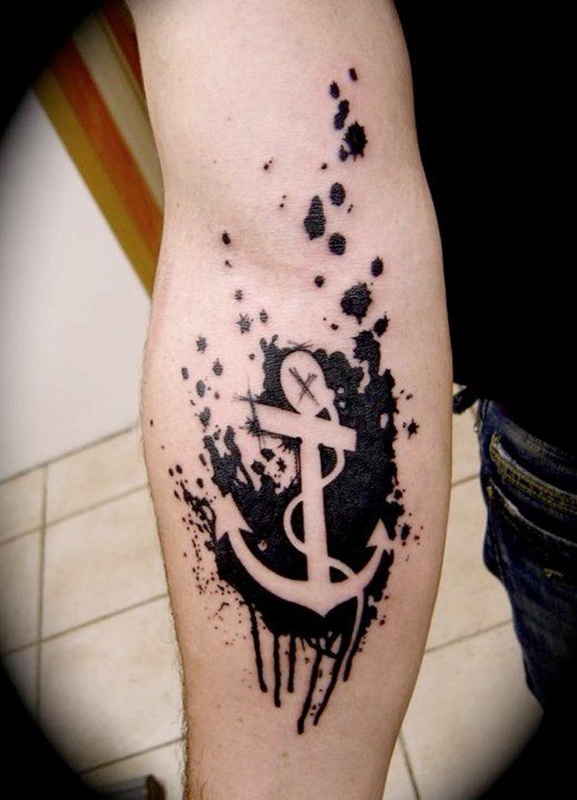 A generic, black anchor is depicted in this tattoo. 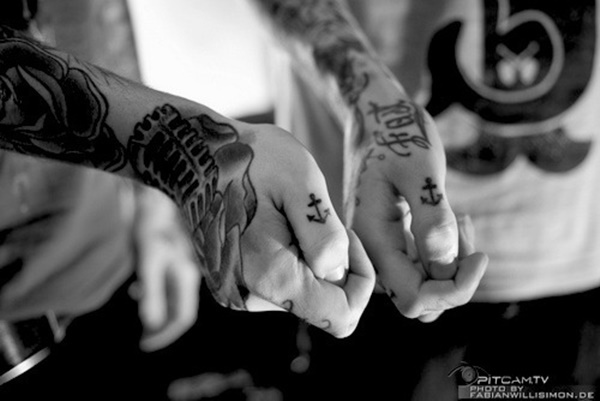 A couple shows off their matching anchor, thumb tattoos. 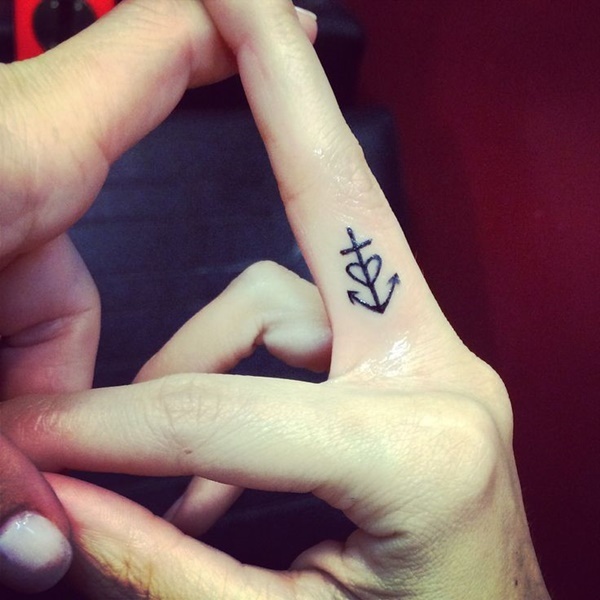 A simple anchor is shown on the wearer’s middle finger knuckle. 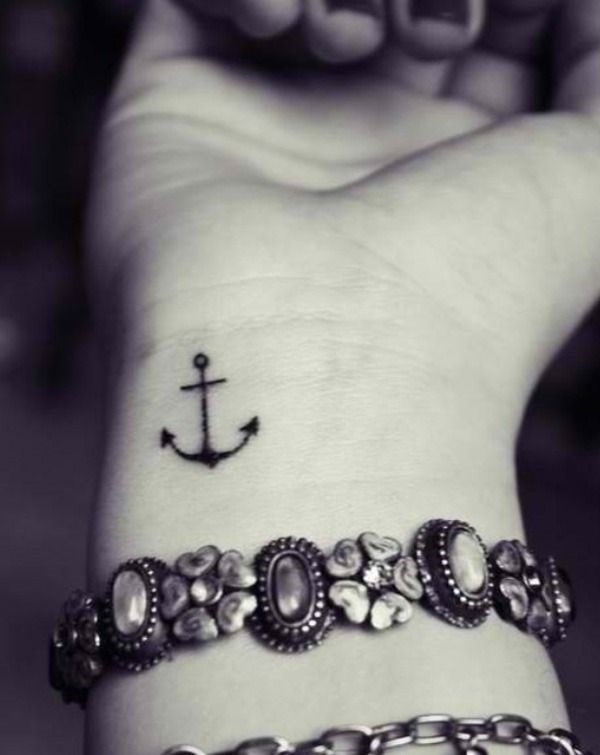 A simple anchor embellished with a rope is located on the wearer’s right wrist. 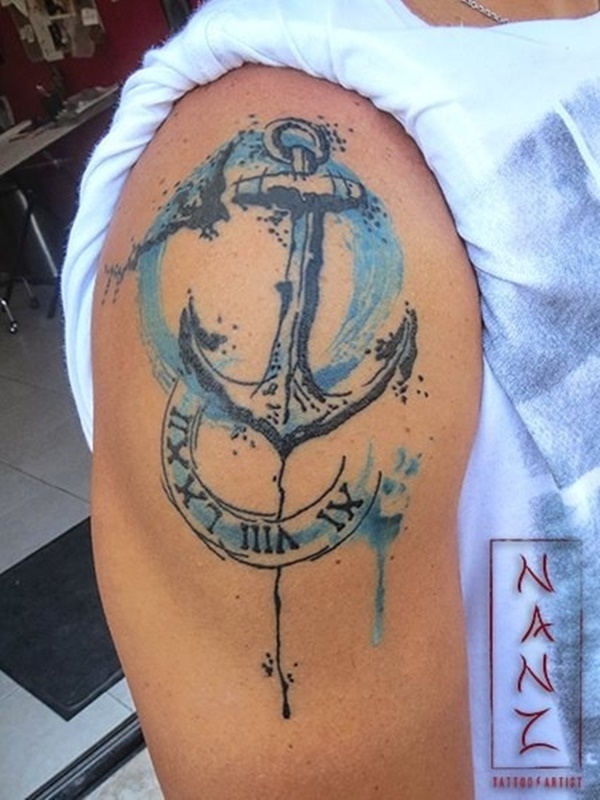 This wimpy interpretation of an anchor is reminiscent of child’s drawing. It’s asymmetrical, the line work is shaky, and the concept is goofy. This tattoo deviates from traditional tribal styling by not coloring the designs black. 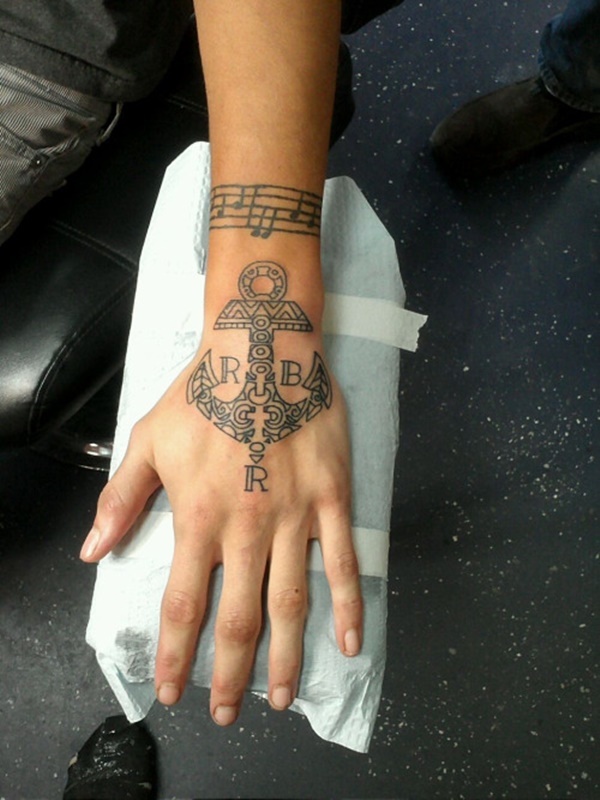 The tribal outlines compose the shape of the anchor and the anchor is surrounded by the letters RBR. 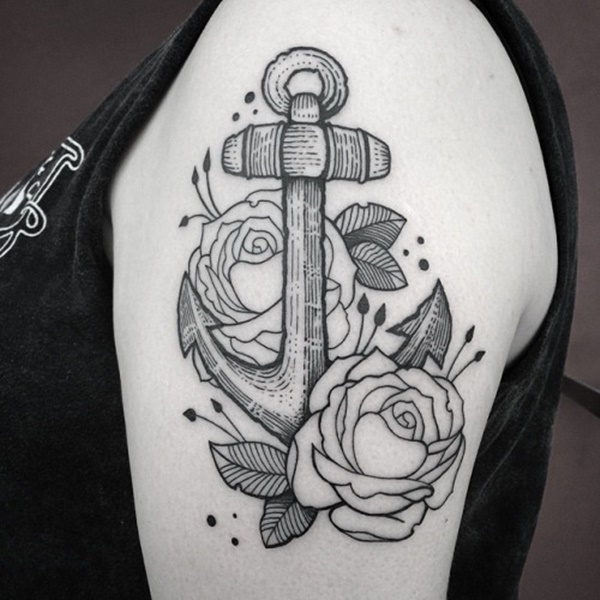 Through the use of traditionally feminine colors and imagery including a heart and a rose this artist has managed to make an anchor cute. 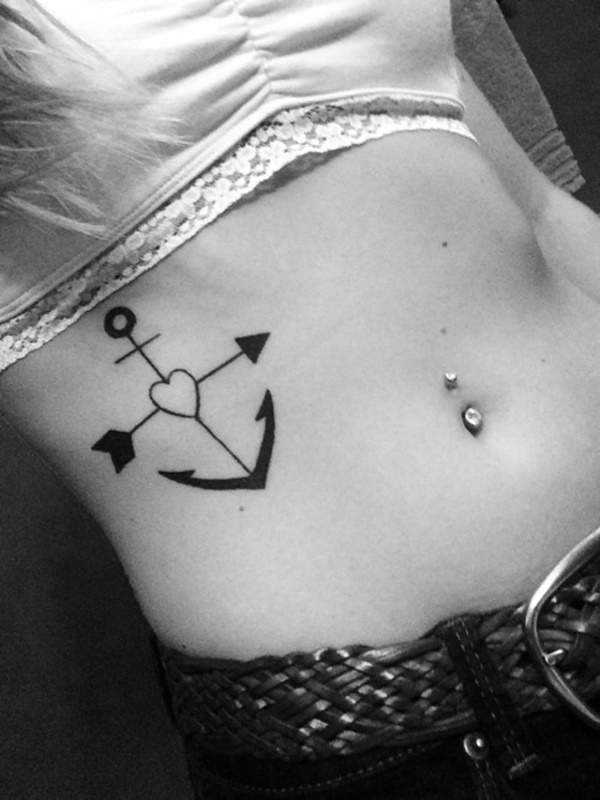 This wearer has a minimally shaded black and gray anchor tattooed over their heart. 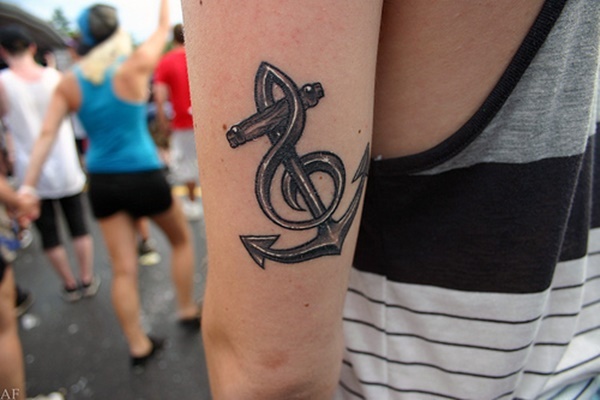 An anchor crossed with a musical staff creates the image of this black and gray tattoo. 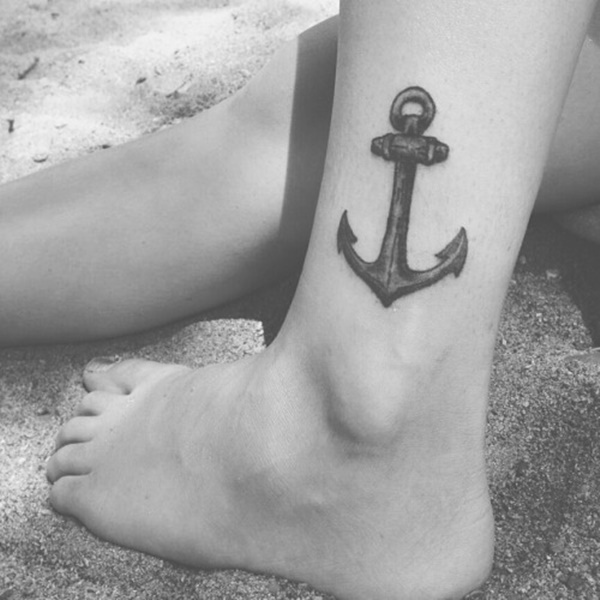 An anchor embellished with scrolled lines sits just above the wearer’s ankle bone. 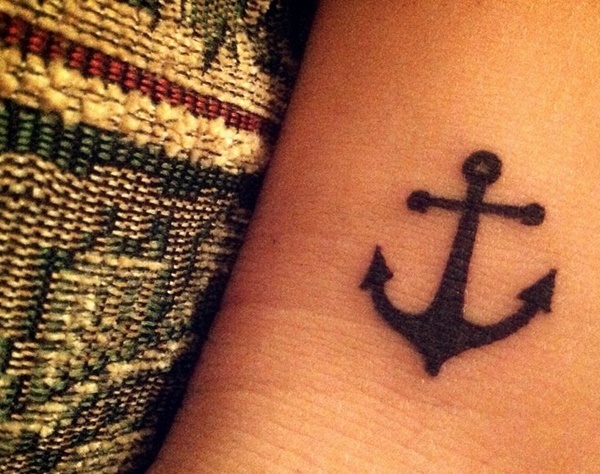 An anchor is created with a bold outline and is located just below the wearer’s elbow. A blacked out anchor is wrapped with a red bow with a heart in the center. 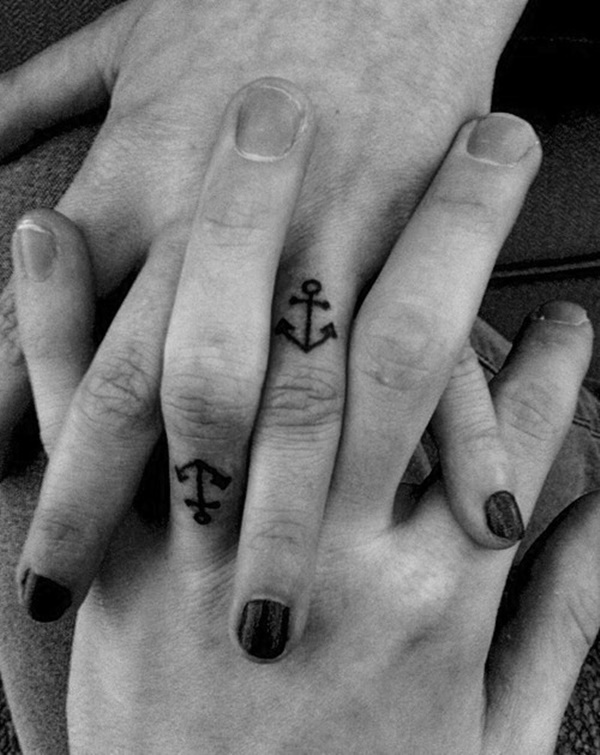 Anchors are shown on the wearer’s ring fingers to signify their marriage. An old cliche refers to marriage as being “tied down”, an anchor seems like a reasonable way to express that. 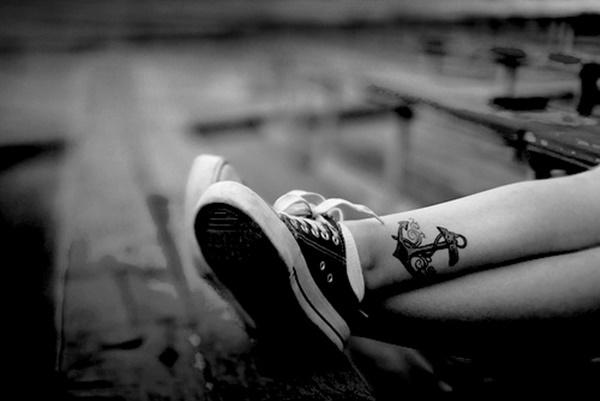 A black anchor embellished with a heart above the crown is displayed just above the wearer’s heel. 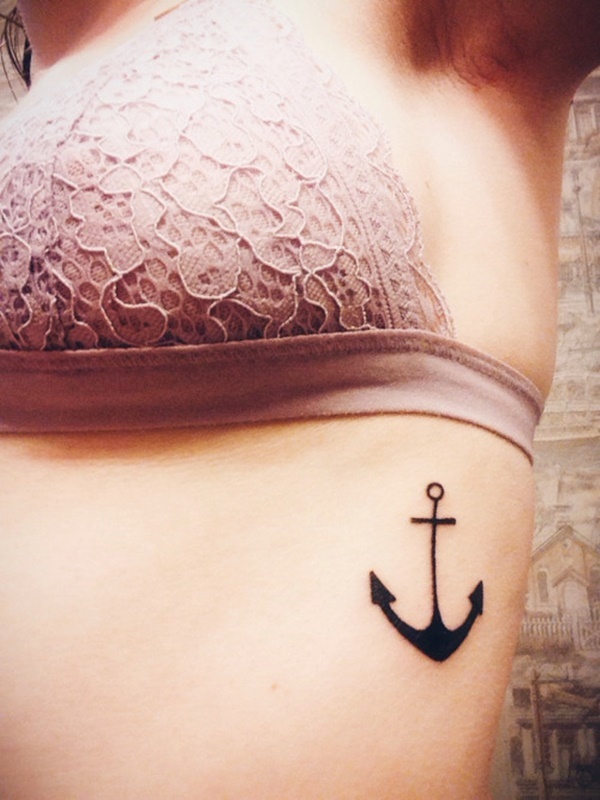 A black and gray anchor wrapped with a rope is shown on the wearer’s rib cage. The ribs are reported as being one of the most painful places to be tattooed. 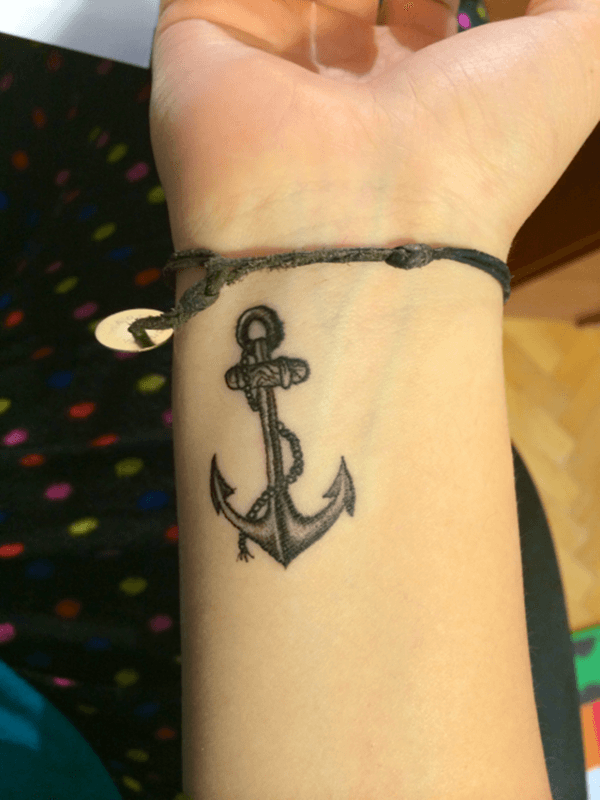 Another example of a blacked out anchor shown on a wearer’s wrist. 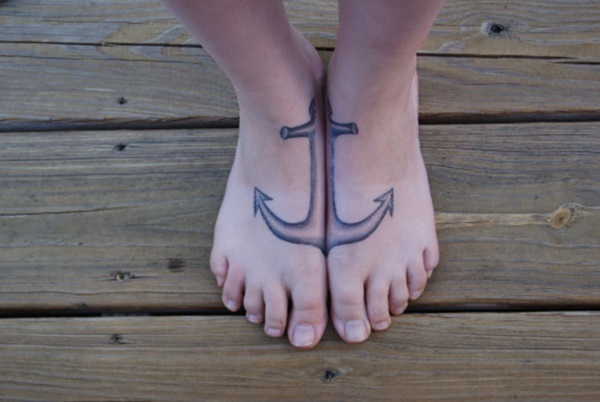 When the wearer places their feet together they unite two halves of a black and gray anchor. Another depiction of an anchor attached to balloons. 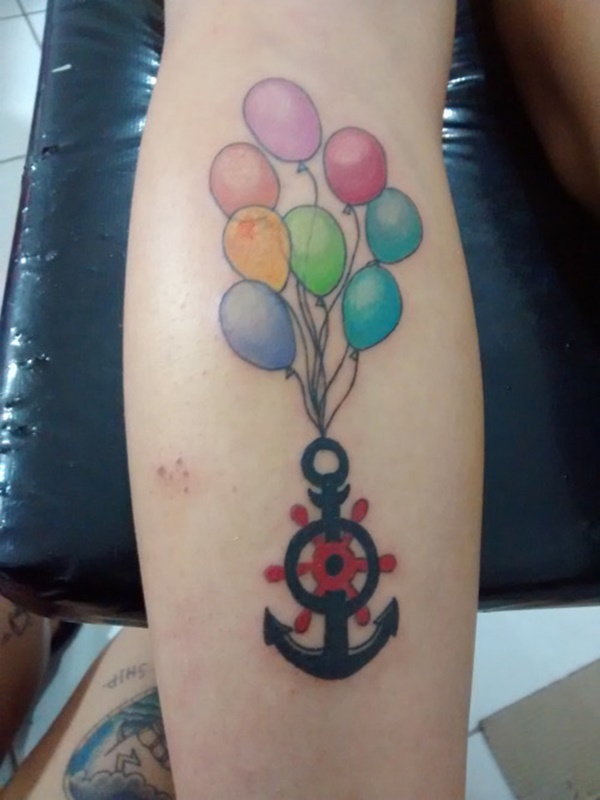 This tattoo differs by replacing the hot air balloon with party balloons and embellishes the shank of the anchor with a ship wheel. 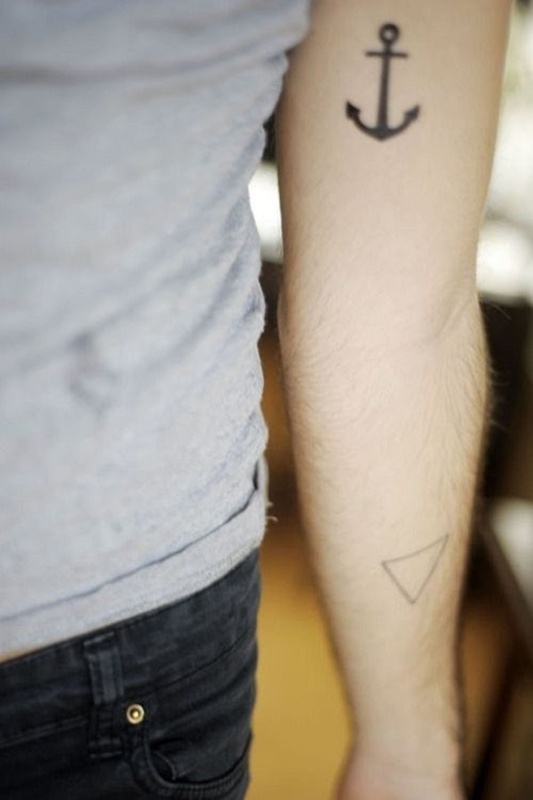 A minimalist variation of a tattoo we have seen previously. This tattoo uses strong outlines and little shading to compose the image. 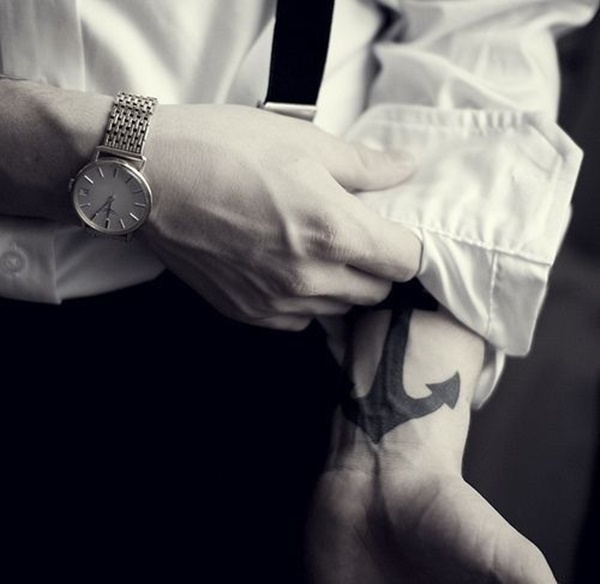 Once again we see a blacked out anchor worn on the wrist. Here we see the quote we have seen earlier. 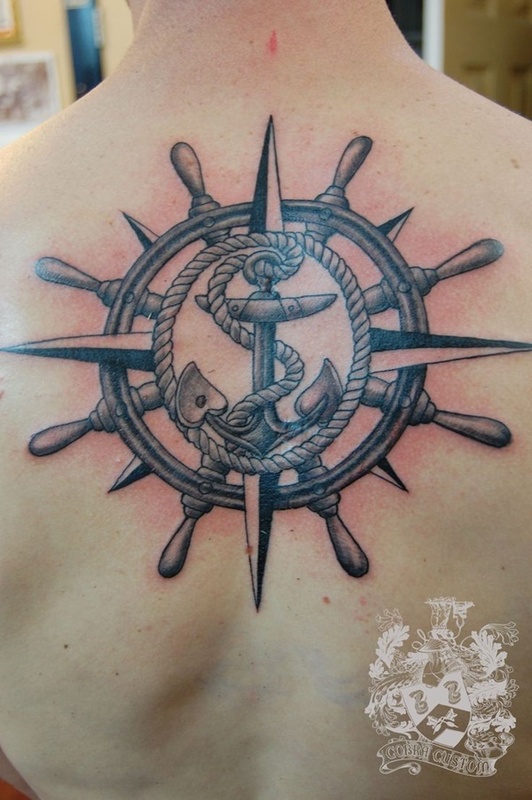 This tattoo differs by using a cartoon style to depict the ship wheel and anchor. 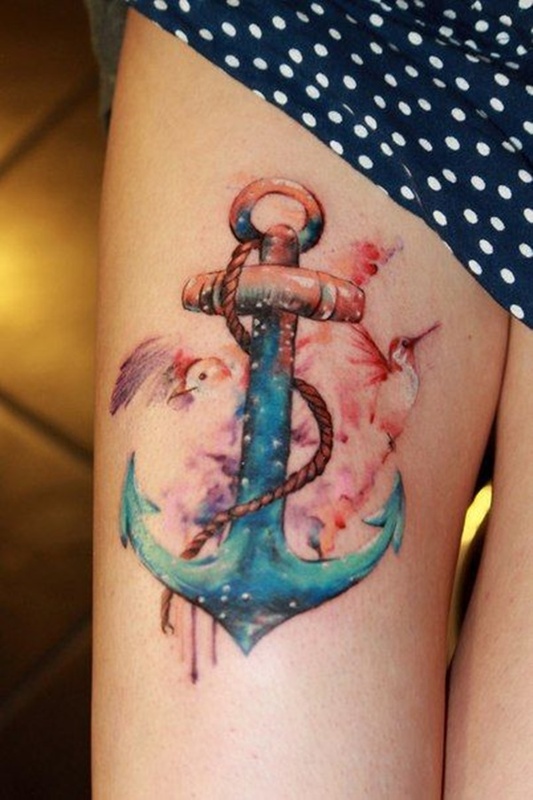 An anchor is portrayed using bold outlines over watercolors. The smear of colors adds an intriguing element to this popular image. 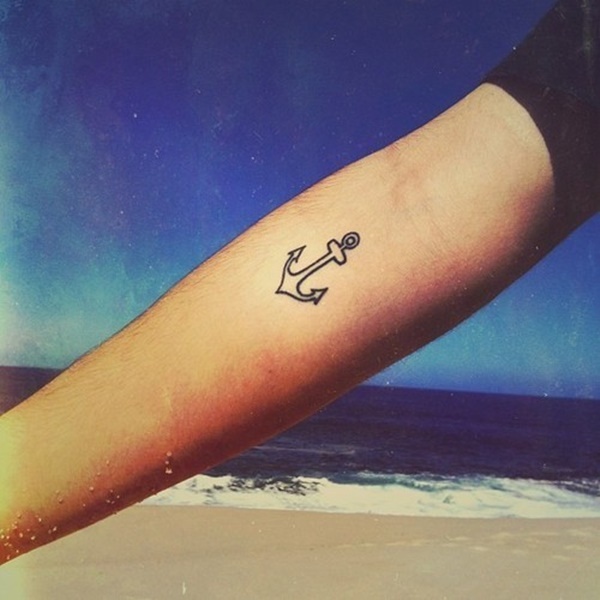 An anchor with a disproportionately long shank is depicted on the wearer’s forearm. 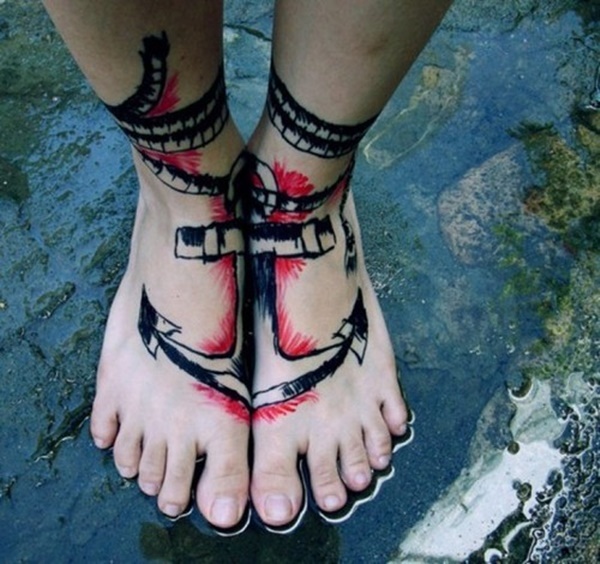 A black anchor is embellished with red lines and split between the wearer’s feet. This tattoo almost runs the entire length of the wearer’s torso. The loop is pictured below the wearer’s neck and the crown stops just above her belly button. The anchor is depicted in a black, yellow, and purple color palette and is embellished with an eye above the crown. 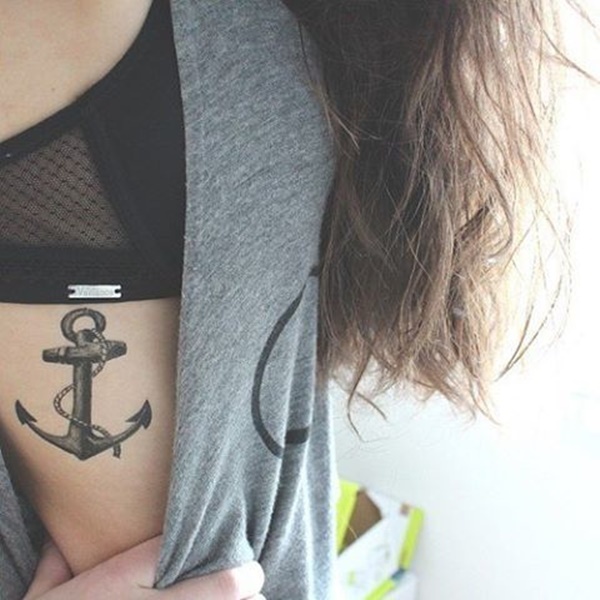 Notice how the shape of the anchor compliments the wearer’s figure as it frames her breasts. 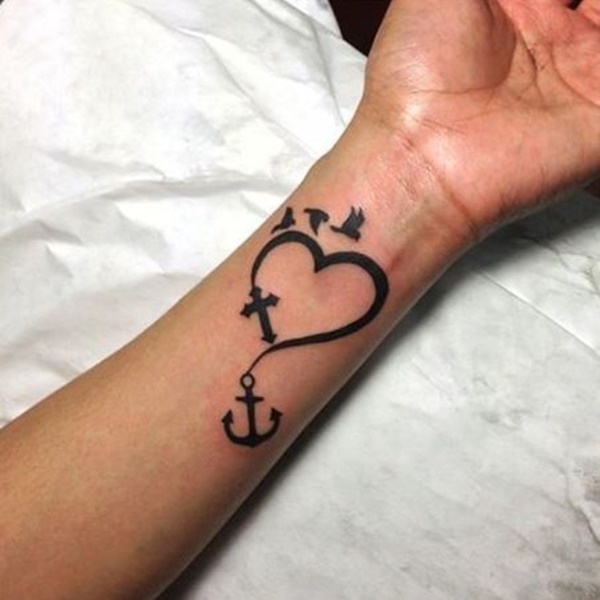 An anchor is portrayed using traditional styling and is embellished with two hearts on the shank. This tattoo displays plenty of contributing elements. The background shows a black honeycomb pattern and blue triangle, while the foreground shows a detailed black anchor accented with ink blots. 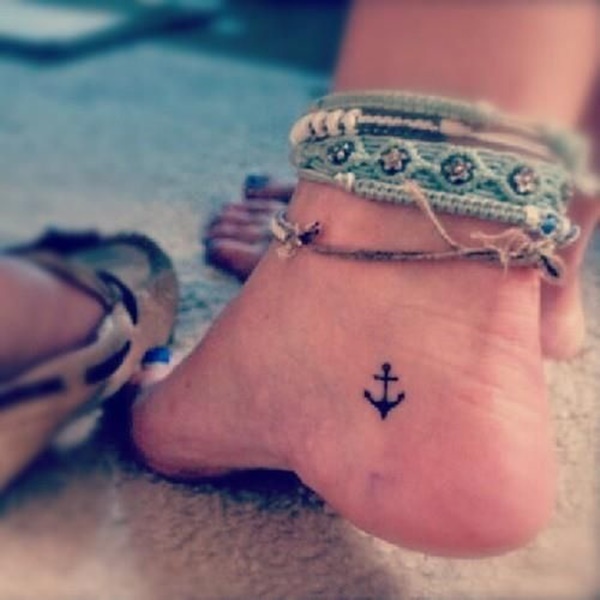 A black and gray anchor is displayed above the wearer’s ankle bone. 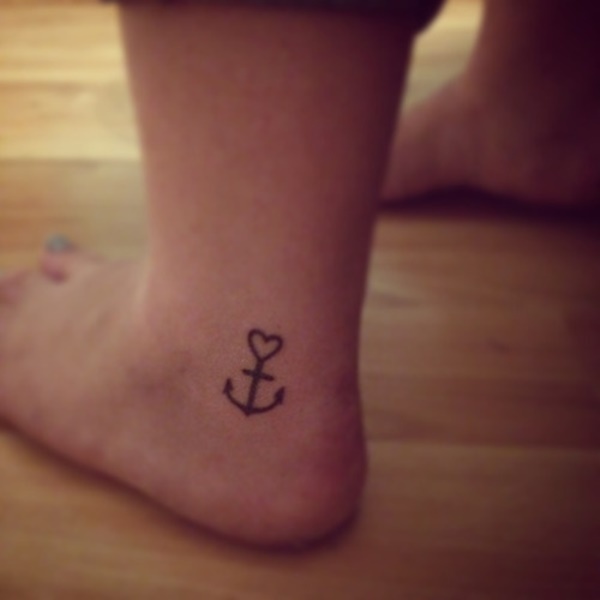 A small black anchor with a heart shaped loop is shown in front of the wearer’s heel. A collection of bird silhouettes create the shape of this anchor. 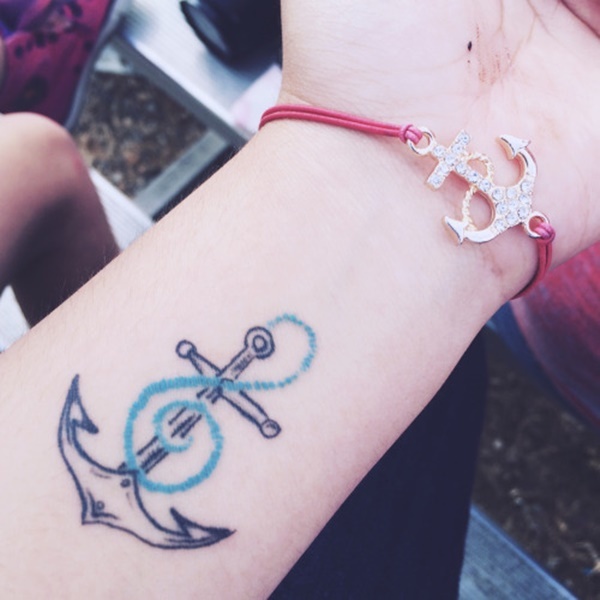 An anchor is detailed with a series of fine lines and is embellished with rosebuds. 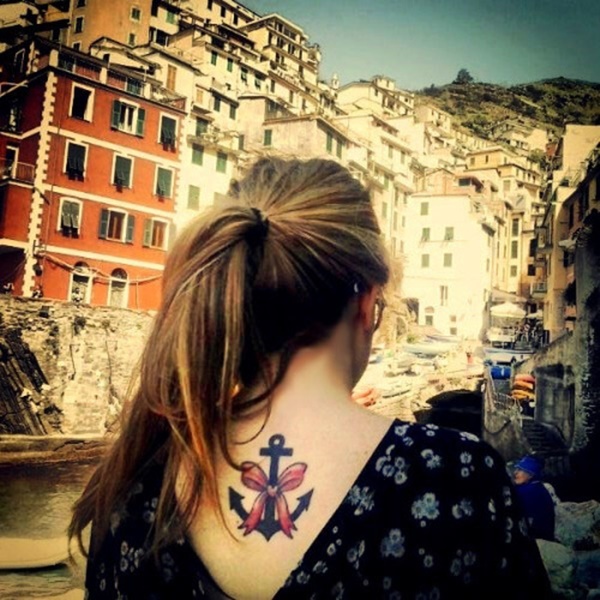 This creative tattoo shows an anchor deteriorating into a series of bird silhouettes. 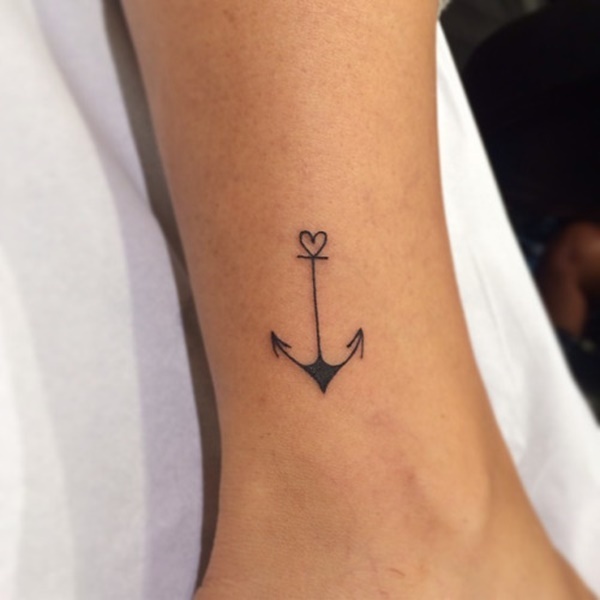 Here we see an anchor comprised of thin lines with a heart shaped loop. 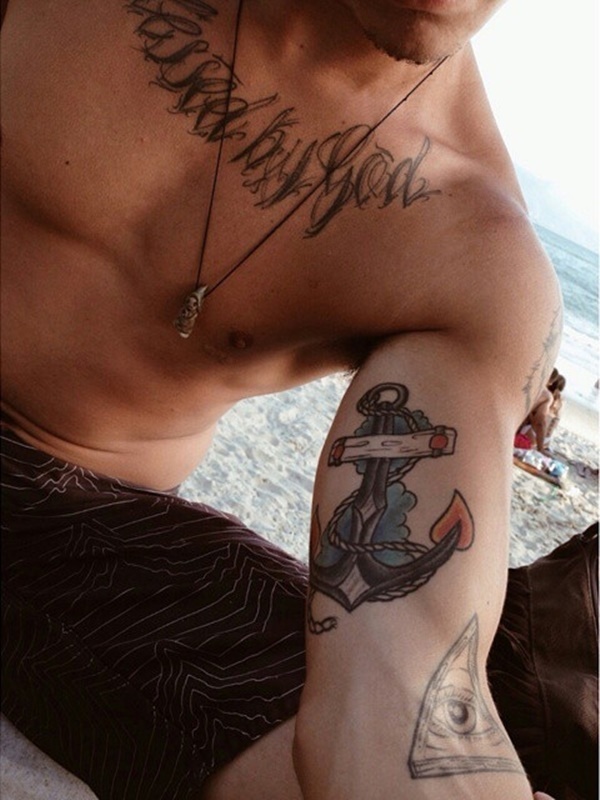 This tattoo uses a red, white, and blue to accent the anchor wrapped with a rope and superimposed over a pair of clouds. Here is a tattoo we saw earlier, shot from a different angle. This angle offers a better view of the details in the eye. 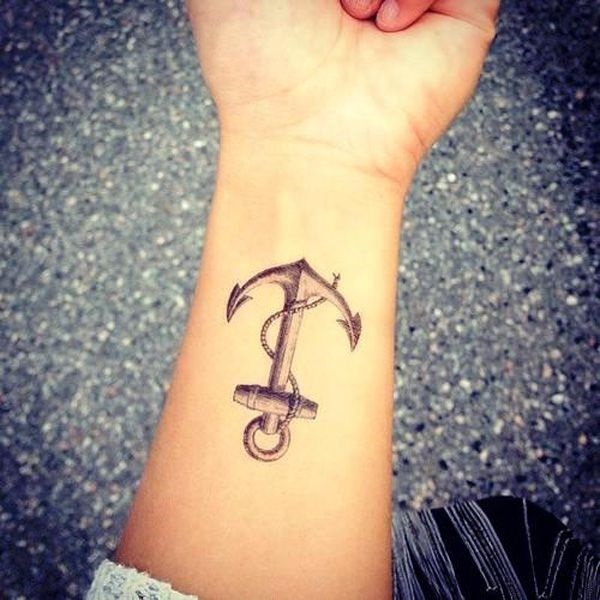 A blacked out anchor with a thin shank and large flukes is shown on the wearer’s rib cage. A bunch of party balloons carry a crudely sketched anchor. 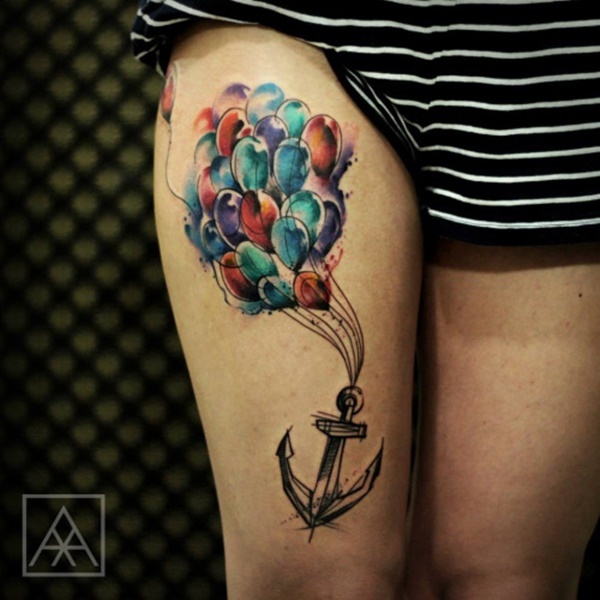 Watercolors color the balloons while the anchor is composed entirely of black ink. A black anchor composed of ink blots lays atop a blue circle and sits above a set of roman numerals in a circle. An arrow replaces the stock of this black anchor and pierces through a heart that sits at the intersection of the stock and shank. An anchor composed of black outlines is embellished with a blue rope. 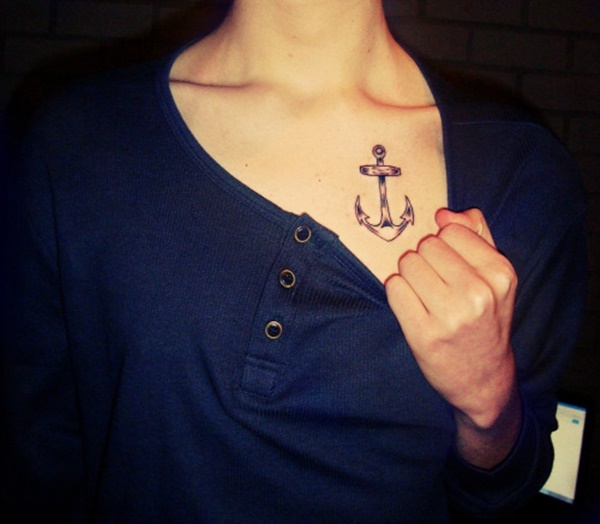 A set of anchors sits above the wearer’s knees. One anchor is blacked out while the other is only composed of an outline.